This article is about the planet. For the deity, see Mars (mythology). For other uses, see Mars (disambiguation). The days and seasons are likewise comparable to those of Earth, because the rotational period as well as the tilt of the rotational axis relative to the ecliptic plane are very similar. Mars is the site of Olympus Mons, the largest volcano and second-highest known mountain in the Solar System, and of Valles Marineris, one of the largest canyons in the Solar System. The smooth Borealis basin in the northern hemisphere covers 40% of the planet and may be a giant impact feature. Mars has two moons, Phobos and Deimos, which are small and irregularly shaped. These may be captured asteroids, similar to 5261 Eureka, a Mars trojan. There are ongoing investigations assessing the past habitability potential of Mars, as well as the possibility of extant life. Future astrobiology missions are planned, including the Mars 2020 and ExoMars rovers. Liquid water cannot exist on the surface of Mars due to low atmospheric pressure, which is less than 1% of the Earth's, except at the lowest elevations for short periods. The two polar ice caps appear to be made largely of water. The volume of water ice in the south polar ice cap, if melted, would be sufficient to cover the entire planetary surface to a depth of 11 meters (36 ft). In November 2016, NASA reported finding a large amount of underground ice in the Utopia Planitia region of Mars. The volume of water detected has been estimated to be equivalent to the volume of water in Lake Superior. Mars can easily be seen from Earth with the naked eye, as can its reddish coloring. Its apparent magnitude reaches −2.94, which is surpassed only by Jupiter, Venus, the Moon, and the Sun. Optical ground-based telescopes are typically limited to resolving features about 300 kilometers (190 mi) across when Earth and Mars are closest because of Earth's atmosphere. Mars is approximately half the diameter of Earth with a surface area only slightly less than the total area of Earth's dry land. Mars is less dense than Earth, having about 15% of Earth's volume and 11% of Earth's mass, resulting in about 38% of Earth's surface gravity. The red-orange appearance of the Martian surface is caused by iron(III) oxide, or rust. It can look like butterscotch; other common surface colors include golden, brown, tan, and greenish, depending on the minerals present. Like Earth, Mars has differentiated into a dense metallic core overlaid by less dense materials. Current models of its interior imply a core with a radius of about 1,794 ± 65 kilometers (1,115 ± 40 mi), consisting primarily of iron and nickel with about 16–17% sulfur. This iron(II) sulfide core is thought to be twice as rich in lighter elements as Earth's. The core is surrounded by a silicate mantle that formed many of the tectonic and volcanic features on the planet, but it appears to be dormant. Besides silicon and oxygen, the most abundant elements in the Martian crust are iron, magnesium, aluminum, calcium, and potassium. The average thickness of the planet's crust is about 50 km (31 mi), with a maximum thickness of 125 km (78 mi). Earth's crust averages 40 km (25 mi). Mars is a terrestrial planet that consists of minerals containing silicon and oxygen, metals, and other elements that typically make up rock. The surface of Mars is primarily composed of tholeiitic basalt, although parts are more silica-rich than typical basalt and may be similar to andesitic rocks on Earth or silica glass. Regions of low albedo suggest concentrations of plagioclase feldspar, with northern low albedo regions displaying higher than normal concentrations of sheet silicates and high-silicon glass. Parts of the southern highlands include detectable amounts of high-calcium pyroxenes. Localized concentrations of hematite and olivine have been found. Much of the surface is deeply covered by finely grained iron(III) oxide dust. Although Mars has no evidence of a structured global magnetic field, observations show that parts of the planet's crust have been magnetized, suggesting that alternating polarity reversals of its dipole field have occurred in the past. This paleomagnetism of magnetically susceptible minerals is similar to the alternating bands found on Earth's ocean floors. One theory, published in 1999 and re-examined in October 2005 (with the help of the Mars Global Surveyor), is that these bands suggest plate tectonic activity on Mars four billion years ago, before the planetary dynamo ceased to function and the planet's magnetic field faded. It is thought that, during the Solar System's formation, Mars was created as the result of a stochastic process of run-away accretion of material from the protoplanetary disk that orbited the Sun. Mars has many distinctive chemical features caused by its position in the Solar System. Elements with comparatively low boiling points, such as chlorine, phosphorus, and sulphur, are much more common on Mars than Earth; these elements were probably pushed outward by the young Sun's energetic solar wind. After the formation of the planets, all were subjected to the so-called "Late Heavy Bombardment". About 60% of the surface of Mars shows a record of impacts from that era, whereas much of the remaining surface is probably underlain by immense impact basins caused by those events. There is evidence of an enormous impact basin in the northern hemisphere of Mars, spanning 10,600 by 8,500 km (6,600 by 5,300 mi), or roughly four times the size of the Moon's South Pole – Aitken basin, the largest impact basin yet discovered. This theory suggests that Mars was struck by a Pluto-sized body about four billion years ago. The event, thought to be the cause of the Martian hemispheric dichotomy, created the smooth Borealis basin that covers 40% of the planet. Noachian period (named after Noachis Terra): Formation of the oldest extant surfaces of Mars, 4.5 to 3.5 billion years ago. Noachian age surfaces are scarred by many large impact craters. The Tharsis bulge, a volcanic upland, is thought to have formed during this period, with extensive flooding by liquid water late in the period. Hesperian period (named after Hesperia Planum): 3.5 to between 3.3 and 2.9 billion years ago. The Hesperian period is marked by the formation of extensive lava plains. Amazonian period (named after Amazonis Planitia): between 3.3 and 2.9 billion years ago to the present. Amazonian regions have few meteorite impact craters, but are otherwise quite varied. Olympus Mons formed during this period, with lava flows elsewhere on Mars. Geological activity is still taking place on Mars. The Athabasca Valles is home to sheet-like lava flows created about 200 Mya. Water flows in the grabens called the Cerberus Fossae occurred less than 20 Mya, indicating equally recent volcanic intrusions. On February 19, 2008, images from the Mars Reconnaissance Orbiter showed evidence of an avalanche from a 700-metre-high (2,300 ft) cliff. The Phoenix lander returned data showing Martian soil to be slightly alkaline and containing elements such as magnesium, sodium, potassium and chlorine. These nutrients are found in soils on Earth, and they are necessary for growth of plants. Experiments performed by the lander showed that the Martian soil has a basic pH of 7.7, and contains 0.6% of the salt perchlorate. This is a very high concentration and makes the Martian soil toxic (see also Martian soil toxicity). Streaks are common across Mars and new ones appear frequently on steep slopes of craters, troughs, and valleys. The streaks are dark at first and get lighter with age. The streaks can start in a tiny area, then spread out for hundreds of metres. They have been seen to follow the edges of boulders and other obstacles in their path. The commonly accepted theories include that they are dark underlying layers of soil revealed after avalanches of bright dust or dust devils. Several other explanations have been put forward, including those that involve water or even the growth of organisms. Liquid water cannot exist on the surface of Mars due to low atmospheric pressure, which is less than 1% that of Earth's, except at the lowest elevations for short periods. The two polar ice caps appear to be made largely of water. The volume of water ice in the south polar ice cap, if melted, would be sufficient to cover the entire planetary surface to a depth of 11 meters (36 ft). A permafrost mantle stretches from the pole to latitudes of about 60°. Large quantities of water ice are thought to be trapped within the thick cryosphere of Mars. Radar data from Mars Express and the Mars Reconnaissance Orbiter show large quantities of water ice at both poles (July 2005) and at middle latitudes (November 2008). 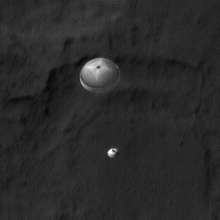 The Phoenix lander directly sampled water ice in shallow Martian soil on July 31, 2008. Landforms visible on Mars strongly suggest that liquid water has existed on the planet's surface. Huge linear swathes of scoured ground, known as outflow channels, cut across the surface in about 25 places. These are thought to be a record of erosion caused by the catastrophic release of water from subsurface aquifers, though some of these structures have been hypothesized to result from the action of glaciers or lava. One of the larger examples, Ma'adim Vallis is 700 km (430 mi) long, much greater than the Grand Canyon, with a width of 20 km (12 mi) and a depth of 2 km (1.2 mi) in places. It is thought to have been carved by flowing water early in Mars's history. The youngest of these channels are thought to have formed as recently as only a few million years ago. Elsewhere, particularly on the oldest areas of the Martian surface, finer-scale, dendritic networks of valleys are spread across significant proportions of the landscape. Features of these valleys and their distribution strongly imply that they were carved by runoff resulting from precipitation in early Mars history. Subsurface water flow and groundwater sapping may play important subsidiary roles in some networks, but precipitation was probably the root cause of the incision in almost all cases. Along crater and canyon walls, there are thousands of features that appear similar to terrestrial gullies. The gullies tend to be in the highlands of the southern hemisphere and to face the Equator; all are poleward of 30° latitude. A number of authors have suggested that their formation process involves liquid water, probably from melting ice, although others have argued for formation mechanisms involving carbon dioxide frost or the movement of dry dust. No partially degraded gullies have formed by weathering and no superimposed impact craters have been observed, indicating that these are young features, possibly still active. Other geological features, such as deltas and alluvial fans preserved in craters, are further evidence for warmer, wetter conditions at an interval or intervals in earlier Mars history. Such conditions necessarily require the widespread presence of crater lakes across a large proportion of the surface, for which there is independent mineralogical, sedimentological and geomorphological evidence. 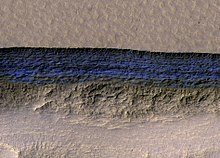 A cross-section of underground water ice is exposed at the steep slope that appears bright blue in this enhanced-color view from the MRO. The scene is about 500 meters wide. The scarp drops about 128 meters from the level ground. The ice sheets extend from just below the surface to a depth of 100 meters or more. Further evidence that liquid water once existed on the surface of Mars comes from the detection of specific minerals such as hematite and goethite, both of which sometimes form in the presence of water. In 2004, Opportunity detected the mineral jarosite. This forms only in the presence of acidic water, which demonstrates that water once existed on Mars. More recent evidence for liquid water comes from the finding of the mineral gypsum on the surface by NASA's Mars rover Opportunity in December 2011. It is estimated that the amount of water in the upper mantle of Mars, represented by hydroxyl ions contained within the minerals of Mars's geology, is equal to or greater than that of Earth at 50–300 parts per million of water, which is enough to cover the entire planet to a depth of 200–1,000 m (660–3,280 ft). In 2005, radar data revealed the presence of large quantities of water ice at the poles and at mid-latitudes. The Mars rover Spirit sampled chemical compounds containing water molecules in March 2007. 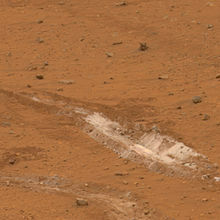 The Phoenix lander directly sampled water ice in shallow Martian soil on July 31, 2008. On March 18, 2013, NASA reported evidence from instruments on the Curiosity rover of mineral hydration, likely hydrated calcium sulfate, in several rock samples including the broken fragments of "Tintina" rock and "Sutton Inlier" rock as well as in veins and nodules in other rocks like "Knorr" rock and "Wernicke" rock. Analysis using the rover's DAN instrument provided evidence of subsurface water, amounting to as much as 4% water content, down to a depth of 60 cm (24 in), during the rover's traverse from the Bradbury Landing site to the Yellowknife Bay area in the Glenelg terrain. In September 2015, NASA announced that they had found conclusive evidence of hydrated brine flows on recurring slope lineae, based on spectrometer readings of the darkened areas of slopes. These observations provided confirmation of earlier hypotheses based on timing of formation and their rate of growth, that these dark streaks resulted from water flowing in the very shallow subsurface. The streaks contain hydrated salts, perchlorates, which have water molecules in their crystal structure. The streaks flow downhill in Martian summer, when the temperature is above −23 degrees Celsius, and freeze at lower temperatures. On September 28, 2015, NASA announced the presence of briny flowing salt water on the Martian surface. Perspective view of Korolev crater shows 1.9 km (1.2 mi) deep water ice. Image taken by ESA’s Mars Express. Researchers suspect that much of the low northern plains of the planet were covered with an ocean hundreds of meters deep, though this remains controversial. In March 2015, scientists stated that such an ocean might have been the size of Earth's Arctic Ocean. This finding was derived from the ratio of water to deuterium in the modern Martian atmosphere compared to that ratio on Earth. The amount of Martian deuterium is eight times the amount that exists on Earth, suggesting that ancient Mars had significantly higher levels of water. Results from the Curiosity rover had previously found a high ratio of deuterium in Gale Crater, though not significantly high enough to suggest the former presence of an ocean. Other scientists caution that these results have not been confirmed, and point out that Martian climate models have not yet shown that the planet was warm enough in the past to support bodies of liquid water. Near the northern polar cap is the 81.4 kilometres (50.6 mi) wide Korolev Crater, where the Mars Express orbiter found it to be filled with approximately 2,200 cubic kilometres (530 cu mi) of water ice. The crater floor lies about 2 kilometres (1.2 mi) below the rim, and is covered by a 1.8 kilometres (1.1 mi) deep central mound of permanent water ice, up to 60 kilometres (37 mi) in diameter. 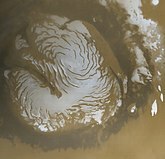 Mars has two permanent polar ice caps. During a pole's winter, it lies in continuous darkness, chilling the surface and causing the deposition of 25–30% of the atmosphere into slabs of CO2 ice (dry ice). When the poles are again exposed to sunlight, the frozen CO2 sublimes. These seasonal actions transport large amounts of dust and water vapor, giving rise to Earth-like frost and large cirrus clouds. Clouds of water-ice were photographed by the Opportunity rover in 2004. The caps at both poles consist primarily (70%) of water ice. Frozen carbon dioxide accumulates as a comparatively thin layer about one metre thick on the north cap in the northern winter only, whereas the south cap has a permanent dry ice cover about eight metres thick. This permanent dry ice cover at the south pole is peppered by flat floored, shallow, roughly circular pits, which repeat imaging shows are expanding by meters per year; this suggests that the permanent CO2 cover over the south pole water ice is degrading over time. The northern polar cap has a diameter of about 1,000 km (620 mi) during the northern Mars summer, and contains about 1.6 million cubic kilometres (380,000 cu mi) of ice, which, if spread evenly on the cap, would be 2 km (1.2 mi) thick. (This compares to a volume of 2.85 million cubic kilometres (680,000 cu mi) for the Greenland ice sheet.) The southern polar cap has a diameter of 350 km (220 mi) and a thickness of 3 km (1.9 mi). The total volume of ice in the south polar cap plus the adjacent layered deposits has been estimated at 1.6 million cubic km. Both polar caps show spiral troughs, which recent analysis of SHARAD ice penetrating radar has shown are a result of katabatic winds that spiral due to the Coriolis Effect. The seasonal frosting of areas near the southern ice cap results in the formation of transparent 1-metre-thick slabs of dry ice above the ground. With the arrival of spring, sunlight warms the subsurface and pressure from subliming CO2 builds up under a slab, elevating and ultimately rupturing it. This leads to geyser-like eruptions of CO2 gas mixed with dark basaltic sand or dust. This process is rapid, observed happening in the space of a few days, weeks or months, a rate of change rather unusual in geology – especially for Mars. The gas rushing underneath a slab to the site of a geyser carves a spiderweb-like pattern of radial channels under the ice, the process being the inverted equivalent of an erosion network formed by water draining through a single plughole. A MOLA-based topographic map showing highlands (red and orange) dominating the southern hemisphere of Mars, lowlands (blue) the northern. Volcanic plateaus delimit regions of the northern plains, whereas the highlands are punctuated by several large impact basins. For more on how geographic references are determined, see Geodetic datum. Although better remembered for mapping the Moon, Johann Heinrich Mädler and Wilhelm Beer were the first "areographers". They began by establishing that most of Mars's surface features were permanent and by more precisely determining the planet's rotation period. In 1840, Mädler combined ten years of observations and drew the first map of Mars. Rather than giving names to the various markings, Beer and Mädler simply designated them with letters; Meridian Bay (Sinus Meridiani) was thus feature "a". Today, features on Mars are named from a variety of sources. Albedo features are named for classical mythology. Craters larger than 60 km are named for deceased scientists and writers and others who have contributed to the study of Mars. Craters smaller than 60 km are named for towns and villages of the world with populations of less than 100,000. Large valleys are named for the word "Mars" or "star" in various languages; small valleys are named for rivers. Large albedo features retain many of the older names, but are often updated to reflect new knowledge of the nature of the features. For example, Nix Olympica (the snows of Olympus) has become Olympus Mons (Mount Olympus). The surface of Mars as seen from Earth is divided into two kinds of areas, with differing albedo. The paler plains covered with dust and sand rich in reddish iron oxides were once thought of as Martian "continents" and given names like Arabia Terra (land of Arabia) or Amazonis Planitia (Amazonian plain). The dark features were thought to be seas, hence their names Mare Erythraeum, Mare Sirenum and Aurorae Sinus. The largest dark feature seen from Earth is Syrtis Major Planum. The permanent northern polar ice cap is named Planum Boreum, whereas the southern cap is called Planum Australe. Mars's equator is defined by its rotation, but the location of its Prime Meridian was specified, as was Earth's (at Greenwich), by choice of an arbitrary point; Mädler and Beer selected a line for their first maps of Mars in 1830. After the spacecraft Mariner 9 provided extensive imagery of Mars in 1972, a small crater (later called Airy-0), located in the Sinus Meridiani ("Middle Bay" or "Meridian Bay"), was chosen for the definition of 0.0° longitude to coincide with the original selection. Because Mars has no oceans and hence no "sea level", a zero-elevation surface had to be selected as a reference level; this is called the areoid of Mars, analogous to the terrestrial geoid. Zero altitude was defined by the height at which there is 610.5 Pa (6.105 mbar) of atmospheric pressure. This pressure corresponds to the triple point of water, and it is about 0.6% of the sea level surface pressure on Earth (0.006 atm). In practice, today this surface is defined directly from satellite gravity measurements. For mapping purposes, the United States Geological Survey divides the surface of Mars into thirty "quadrangles", each named for a prominent physiographic feature within that quadrangle. The quadrangles can be seen and explored via the interactive image map below. The thirty cartographic quadrangles of Mars, defined by the United States Geological Survey. The quadrangles are numbered with the prefix "MC" for "Mars Chart." Click on a quadrangle name link and you will be taken to the corresponding article. North is at the top; 0°N 180°W﻿ / ﻿0°N 180°W﻿ / 0; -180 is at the far left on the equator. The map images were taken by the Mars Global Surveyor. The dichotomy of Martian topography is striking: northern plains flattened by lava flows contrast with the southern highlands, pitted and cratered by ancient impacts. Research in 2008 has presented evidence regarding a theory proposed in 1980 postulating that, four billion years ago, the northern hemisphere of Mars was struck by an object one-tenth to two-thirds the size of Earth's Moon. If validated, this would make the northern hemisphere of Mars the site of an impact crater 10,600 by 8,500 km (6,600 by 5,300 mi) in size, or roughly the area of Europe, Asia, and Australia combined, surpassing the South Pole–Aitken basin as the largest impact crater in the Solar System. Mars is scarred by a number of impact craters: a total of 43,000 craters with a diameter of 5 km (3.1 mi) or greater have been found. The largest confirmed of these is the Hellas impact basin, a light albedo feature clearly visible from Earth. Due to the smaller mass of Mars, the probability of an object colliding with the planet is about half that of Earth. Mars is located closer to the asteroid belt, so it has an increased chance of being struck by materials from that source. Mars is more likely to be struck by short-period comets, i.e., those that lie within the orbit of Jupiter. In spite of this, there are far fewer craters on Mars compared with the Moon, because the atmosphere of Mars provides protection against small meteors and surface modifying processes have erased some craters. Martian craters can have a morphology that suggests the ground became wet after the meteor impacted. Viking 1 image of Olympus Mons. The volcano and related terrain are approximately 550 km (340 mi) across. The shield volcano Olympus Mons (Mount Olympus) is an extinct volcano in the vast upland region Tharsis, which contains several other large volcanoes. 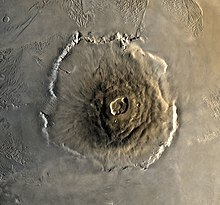 Olympus Mons is roughly three times the height of Mount Everest, which in comparison stands at just over 8.8 km (5.5 mi). It is either the tallest or second-tallest mountain in the Solar System, depending on how it is measured, with various sources giving figures ranging from about 21 to 27 km (13 to 17 mi) high. The large canyon, Valles Marineris (Latin for "Mariner Valleys", also known as Agathadaemon in the old canal maps), has a length of 4,000 km (2,500 mi) and a depth of up to 7 km (4.3 mi). The length of Valles Marineris is equivalent to the length of Europe and extends across one-fifth the circumference of Mars. By comparison, the Grand Canyon on Earth is only 446 km (277 mi) long and nearly 2 km (1.2 mi) deep. Valles Marineris was formed due to the swelling of the Tharsis area, which caused the crust in the area of Valles Marineris to collapse. In 2012, it was proposed that Valles Marineris is not just a graben, but a plate boundary where 150 km (93 mi) of transverse motion has occurred, making Mars a planet with possibly a two-tectonic plate arrangement. Images from the Thermal Emission Imaging System (THEMIS) aboard NASA's Mars Odyssey orbiter have revealed seven possible cave entrances on the flanks of the volcano Arsia Mons. The caves, named after loved ones of their discoverers, are collectively known as the "seven sisters". Cave entrances measure from 100 to 252 m (328 to 827 ft) wide and they are estimated to be at least 73 to 96 m (240 to 315 ft) deep. Because light does not reach the floor of most of the caves, it is possible that they extend much deeper than these lower estimates and widen below the surface. "Dena" is the only exception; its floor is visible and was measured to be 130 m (430 ft) deep. The interiors of these caverns may be protected from micrometeoroids, UV radiation, solar flares and high energy particles that bombard the planet's surface. Mars lost its magnetosphere 4 billion years ago, possibly because of numerous asteroid strikes, so the solar wind interacts directly with the Martian ionosphere, lowering the atmospheric density by stripping away atoms from the outer layer. Both Mars Global Surveyor and Mars Express have detected ionised atmospheric particles trailing off into space behind Mars, and this atmospheric loss is being studied by the MAVEN orbiter. Compared to Earth, the atmosphere of Mars is quite rarefied. Atmospheric pressure on the surface today ranges from a low of 30 Pa (0.030 kPa) on Olympus Mons to over 1,155 Pa (1.155 kPa) in Hellas Planitia, with a mean pressure at the surface level of 600 Pa (0.60 kPa). The highest atmospheric density on Mars is equal to that found 35 km (22 mi) above Earth's surface. The resulting mean surface pressure is only 0.6% of that of Earth (101.3 kPa). The scale height of the atmosphere is about 10.8 km (6.7 mi), which is higher than Earth's, 6 km (3.7 mi), because the surface gravity of Mars is only about 38% of Earth's, an effect offset by both the lower temperature and 50% higher average molecular weight of the atmosphere of Mars. The atmosphere of Mars consists of about 96% carbon dioxide, 1.93% argon and 1.89% nitrogen along with traces of oxygen and water. The atmosphere is quite dusty, containing particulates about 1.5 µm in diameter which give the Martian sky a tawny color when seen from the surface. It may take on a pink hue due to iron oxide particles suspended in it. Methane has been detected in the Martian atmosphere; it occurs in extended plumes, and the profiles imply that the methane is released from discrete regions. The concentration of methane fluctuates from about 0.24 ppb during the northern winter to about 0.65 ppb during the summer. In northern midsummer 2003, the principal plume contained 19,000 metric tons of methane, with an estimated source strength of 0.6 kilograms per second. The profiles suggest that there may be two local source regions, the first centered near 30°N 260°W﻿ / ﻿30°N 260°W﻿ / 30; -260 and the second near 0°N 310°W﻿ / ﻿0°N 310°W﻿ / 0; -310. It is estimated that Mars must produce 270 tonnes per year of methane. Methane can exist in the Martian atmosphere for only a limited period before it is destroyed—estimates of its lifetime range from 0.6–4 years. Its presence despite this short lifetime indicates that an active source of the gas must be present. Volcanic activity, cometary impacts, and the presence of methanogenic microbial life forms are among possible sources. Methane could be produced by a non-biological process called serpentinization[c] involving water, carbon dioxide, and the mineral olivine, which is known to be common on Mars. The Curiosity rover, which landed on Mars in August 2012, is able to make measurements that distinguish between different isotopologues of methane, but even if the mission is to determine that microscopic Martian life is the source of the methane, the life forms likely reside far below the surface, outside of the rover's reach. The first measurements with the Tunable Laser Spectrometer (TLS) indicated that there is less than 5 ppb of methane at the landing site at the point of the measurement. On September 19, 2013, NASA scientists, from further measurements by Curiosity, reported no detection of atmospheric methane with a measured value of 6999180000000000000♠0.18±0.67 ppbv corresponding to an upper limit of only 1.3 ppbv (95% confidence limit) and, as a result, conclude that the probability of current methanogenic microbial activity on Mars is reduced. The Mars Orbiter Mission by India is searching for methane in the atmosphere, while the ExoMars Trace Gas Orbiter, launched in 2016, would further study the methane as well as its decomposition products, such as formaldehyde and methanol. During measurements lasting from April to August 2018, the satellite failed to detect any atmospheric methane, hinting at a new and hitherto unknown process by which CH4 is rapidly removed from the atmosphere in a short space of time. On December 16, 2014, NASA reported the Curiosity rover detected a "tenfold spike", likely localized, in the amount of methane in the Martian atmosphere. Sample measurements taken "a dozen times over 20 months" showed increases in late 2013 and early 2014, averaging "7 parts of methane per billion in the atmosphere." Before and after that, readings averaged around one-tenth that level. Ammonia was tentatively detected on Mars by the Mars Express satellite, but with its relatively short lifetime, it is not clear what produced it. Ammonia is not stable in the Martian atmosphere and breaks down after a few hours. One possible source is volcanic activity. In September 2017, NASA reported radiation levels on the surface of the planet Mars were temporarily doubled, and were associated with an aurora 25 times brighter than any observed earlier, due to a massive, and unexpected, solar storm in the middle of the month. In 1994, the European Space Agency's Mars Express found an ultraviolet glow coming from "magnetic umbrellas" in the southern hemisphere. Mars does not have a global magnetic field which guides charged particles entering the atmosphere. Mars has multiple umbrella-shaped magnetic fields mainly in the southern hemisphere, which are remnants of a global field that decayed billions of years ago. In late December 2014, NASA's MAVEN spacecraft detected evidence of widespread auroras in Mars's northern hemisphere and descended to approximately 20–30 degrees North latitude of Mars's equator. The particles causing the aurora penetrated into the Martian atmosphere, creating auroras below 100 km above the surface, Earth's auroras range from 100 km to 500 km above the surface. Magnetic fields in the solar wind drape over Mars, into the atmosphere, and the charged particles follow the solar wind magnetic field lines into the atmosphere, causing auroras to occur outside the magnetic umbrellas. On March 18, 2015, NASA reported the detection of an aurora that is not fully understood and an unexplained dust cloud in the atmosphere of Mars. Of all the planets in the Solar System, the seasons of Mars are the most Earth-like, due to the similar tilts of the two planets' rotational axes. The lengths of the Martian seasons are about twice those of Earth's because Mars's greater distance from the Sun leads to the Martian year being about two Earth years long. Martian surface temperatures vary from lows of about −143 °C (−225 °F) at the winter polar caps to highs of up to 35 °C (95 °F) in equatorial summer. The wide range in temperatures is due to the thin atmosphere which cannot store much solar heat, the low atmospheric pressure, and the low thermal inertia of Martian soil. The planet is 1.52 times as far from the Sun as Earth, resulting in just 43% of the amount of sunlight. If Mars had an Earth-like orbit, its seasons would be similar to Earth's because its axial tilt is similar to Earth's. The comparatively large eccentricity of the Martian orbit has a significant effect. Mars is near perihelion when it is summer in the southern hemisphere and winter in the north, and near aphelion when it is winter in the southern hemisphere and summer in the north. As a result, the seasons in the southern hemisphere are more extreme and the seasons in the northern are milder than would otherwise be the case. The summer temperatures in the south can be warmer than the equivalent summer temperatures in the north by up to 30 °C (54 °F). Mars has the largest dust storms in the Solar System, reaching speeds of over 160 km/h (100 mph). These can vary from a storm over a small area, to gigantic storms that cover the entire planet. They tend to occur when Mars is closest to the Sun, and have been shown to increase the global temperature. Mars is about 230 million km (143 million mi) from the Sun; its orbital period is 687 (Earth) days, depicted in red. Earth's orbit is in blue. Mars's average distance from the Sun is roughly 230 million km (143 million mi), and its orbital period is 687 (Earth) days. The solar day (or sol) on Mars is only slightly longer than an Earth day: 24 hours, 39 minutes, and 35.244 seconds. A Martian year is equal to 1.8809 Earth years, or 1 year, 320 days, and 18.2 hours. The axial tilt of Mars is 25.19 degrees relative to its orbital plane, which is similar to the axial tilt of Earth. As a result, Mars has seasons like Earth, though on Mars they are nearly twice as long because its orbital period is that much longer. In the present day epoch, the orientation of the north pole of Mars is close to the star Deneb. Mars has a relatively pronounced orbital eccentricity of about 0.09; of the seven other planets in the Solar System, only Mercury has a larger orbital eccentricity. It is known that in the past, Mars has had a much more circular orbit. At one point, 1.35 million Earth years ago, Mars had an eccentricity of roughly 0.002, much less than that of Earth today. Mars's cycle of eccentricity is 96,000 Earth years compared to Earth's cycle of 100,000 years. Mars has a much longer cycle of eccentricity, with a period of 2.2 million Earth years, and this overshadows the 96,000-year cycle in the eccentricity graphs. For the last 35,000 years, the orbit of Mars has been getting slightly more eccentric because of the gravitational effects of the other planets. The closest distance between Earth and Mars will continue to mildly decrease for the next 25,000 years. The current understanding of planetary habitability—the ability of a world to develop environmental conditions favorable to the emergence of life—favors planets that have liquid water on their surface. Most often this requires the orbit of a planet to lie within the habitable zone, which for the Sun extends from just beyond Venus to about the semi-major axis of Mars. During perihelion, Mars dips inside this region, but Mars's thin (low-pressure) atmosphere prevents liquid water from existing over large regions for extended periods. The past flow of liquid water demonstrates the planet's potential for habitability. Recent evidence has suggested that any water on the Martian surface may have been too salty and acidic to support regular terrestrial life. The lack of a magnetosphere and the extremely thin atmosphere of Mars are a challenge: the planet has little heat transfer across its surface, poor insulation against bombardment of the solar wind and insufficient atmospheric pressure to retain water in a liquid form (water instead sublimes to a gaseous state). Mars is nearly, or perhaps totally, geologically dead; the end of volcanic activity has apparently stopped the recycling of chemicals and minerals between the surface and interior of the planet. 4. Thus, only highly refractory and/or well-protected (sub-surface) organics or life forms are likely to survive. 4. This suggests a severely arid environment, with minimal or no liquid water interaction. Scientists have proposed that carbonate globules found in meteorite ALH84001, which is thought to have originated from Mars, could be fossilized microbes extant on Mars when the meteorite was blasted from the Martian surface by a meteor strike some 15 million years ago. This proposal has been met with skepticism, and an exclusively inorganic origin for the shapes has been proposed. Small quantities of methane and formaldehyde detected by Mars orbiters are both claimed to be possible evidence for life, as these chemical compounds would quickly break down in the Martian atmosphere. Alternatively, these compounds may instead be replenished by volcanic or other geological means, such as serpentinization. Impact glass, formed by the impact of meteors, which on Earth can preserve signs of life, has been found on the surface of the impact craters on Mars. Likewise, the glass in impact craters on Mars could have preserved signs of life if life existed at the site. In May 2017, evidence of the earliest known life on land on Earth may have been found in 3.48-billion-year-old geyserite and other related mineral deposits (often found around hot springs and geysers) uncovered in the Pilbara Craton of Western Australia. These findings may be helpful in deciding where best to search for early signs of life on the planet Mars. In early 2018, media reports speculated that certain rock features at a site called Jura looked like a type of fossil, but project scientists say the formations likely resulted from a geological process at the bottom of an ancient drying lakebed, and are related to mineral veins in the area similar to gypsum crystals. On June 7, 2018, NASA announced that the Curiosity rover had discovered organic compounds in sedimentary rocks dating to three billion years old, indicating that some of the building blocks for life were present. In July 2018, scientists reported the discovery of a subglacial lake on Mars, the first known stable body of water on the planet. It sits 1.5 km (0.9 mi) below the surface at the base of the southern polar ice cap and is about 20 km (12 mi) wide. The lake was discovered using the MARSIS radar on board the Mars Express orbiter, and the profiles were collected between May 2012 and December 2015. The lake is centered at 193°E, 81°S, a flat area that does not exhibit any peculiar topographic characteristics. It is mostly surrounded by higher ground except on its eastern side, where there is a depression. Mars has two relatively small (compared to Earth's) natural moons, Phobos (about 22 km (14 mi) in diameter) and Deimos (about 12 km (7.5 mi) in diameter), which orbit close to the planet. Asteroid capture is a long-favored theory, but their origin remains uncertain. Both satellites were discovered in 1877 by Asaph Hall; they are named after the characters Phobos (panic/fear) and Deimos (terror/dread), who, in Greek mythology, accompanied their father Ares, god of war, into battle. Mars was the Roman counterpart of Ares. In modern Greek, the planet retains its ancient name Ares (Aris: Άρης). From the surface of Mars, the motions of Phobos and Deimos appear different from that of the Moon. Phobos rises in the west, sets in the east, and rises again in just 11 hours. Deimos, being only just outside synchronous orbit – where the orbital period would match the planet's period of rotation – rises as expected in the east but slowly. Despite the 30-hour orbit of Deimos, 2.7 days elapse between its rise and set for an equatorial observer, as it slowly falls behind the rotation of Mars. Because the orbit of Phobos is below synchronous altitude, the tidal forces from the planet Mars are gradually lowering its orbit. In about 50 million years, it could either crash into Mars's surface or break up into a ring structure around the planet. The origin of the two moons is not well understood. Their low albedo and carbonaceous chondrite composition have been regarded as similar to asteroids, supporting the capture theory. The unstable orbit of Phobos would seem to point towards a relatively recent capture. But both have circular orbits, near the equator, which is unusual for captured objects and the required capture dynamics are complex. Accretion early in the history of Mars is plausible, but would not account for a composition resembling asteroids rather than Mars itself, if that is confirmed. A third possibility is the involvement of a third body or a type of impact disruption. More-recent lines of evidence for Phobos having a highly porous interior, and suggesting a composition containing mainly phyllosilicates and other minerals known from Mars, point toward an origin of Phobos from material ejected by an impact on Mars that reaccreted in Martian orbit, similar to the prevailing theory for the origin of Earth's moon. Although the VNIR spectra of the moons of Mars resemble those of outer-belt asteroids, the thermal infrared spectra of Phobos are reported to be inconsistent with chondrites of any class. 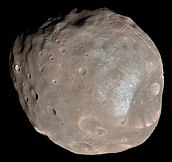 Mars may have moons smaller than 50 to 100 metres (160 to 330 ft) in diameter, and a dust ring is predicted to exist between Phobos and Deimos. Dozens of crewless spacecraft, including orbiters, landers, and rovers, have been sent to Mars by the Soviet Union, the United States, Europe, and India to study the planet's surface, climate, and geology. As of 2018[update], Mars is host to eight functioning spacecraft: six in orbit—2001 Mars Odyssey, Mars Express, Mars Reconnaissance Orbiter, MAVEN, Mars Orbiter Mission and ExoMars Trace Gas Orbiter—and two on the surface—Mars Science Laboratory Curiosity (rover) and InSight (lander). Another rover, Opportunity, is inactive now, but NASA still hopes to reestablish contact with it. The public can request images of Mars via the Mars Reconnaissance Orbiter's HiWish program. The Mars Science Laboratory, named Curiosity, launched on November 26, 2011, and reached Mars on August 6, 2012 UTC. It is larger and more advanced than the Mars Exploration Rovers, with a movement rate up to 90 m (300 ft) per hour. Experiments include a laser chemical sampler that can deduce the make-up of rocks at a distance of 7 m (23 ft). On February 10, 2013, the Curiosity rover obtained the first deep rock samples ever taken from another planetary body, using its on-board drill. The same year, it discovered that Mars's soil contains between 1.5% and 3% water by mass (albeit attached to other compounds and thus not freely accessible). Observations by the Mars Reconnaissance Orbiter had previously revealed the possibility of flowing water during the warmest months on Mars. On September 24, 2014, Mars Orbiter Mission (MOM), launched by the Indian Space Research Organisation, reached Mars orbit. ISRO launched MOM on November 5, 2013, with the aim of analyzing the Martian atmosphere and topography. The Mars Orbiter Mission used a Hohmann transfer orbit to escape Earth's gravitational influence and catapult into a nine-month-long voyage to Mars. The mission is the first successful Asian interplanetary mission. The European Space Agency, in collaboration with Roscosmos, launched the ExoMars Trace Gas Orbiter and Schiaparelli lander on March 14, 2016. While the Trace Gas Orbiter successfully entered Mars orbit on October 19, 2016, Schiaparelli crashed during its landing attempt. In May 2018 NASA's InSight lander was launched, along with the twin MarCO CubeSats that will fly by Mars and provide a telemetry relay for the landing. The mission arrived at Mars in November 2018. NASA plans to launch its Mars 2020 astrobiology rover in July or August 2020. The European Space Agency will launch the ExoMars rover and surface platform in July 2020. The United Arab Emirates' Mars Hope orbiter is planned for launch in 2020, reaching Mars orbit in 2021. The probe will make a global study of the Martian atmosphere. Several plans for a human mission to Mars have been proposed throughout the 20th century and into the 21st century, but no active plan has an arrival date sooner than the 2020s. SpaceX founder Elon Musk presented a plan in September 2016 to, optimistically, launch space tourists to Mars in 2024 at an estimated development cost of US$10 billion. In October 2016, President Barack Obama renewed U.S. policy to pursue the goal of sending humans to Mars in the 2030s, and to continue using the International Space Station as a technology incubator in that pursuit. The NASA Authorization Act of 2017 directed NASA to get humans near or on the surface of Mars by the early 2030s. With the presence of various orbiters, landers, and rovers, it is possible to practice astronomy from Mars. Although Mars's moon Phobos appears about one-third the angular diameter of the full moon on Earth, Deimos appears more or less star-like, looking only slightly brighter than Venus does from Earth. Various phenomena seen from Earth have also been observed from Mars, such as meteors and auroras. The apparent sizes of the moons Phobos and Deimos are sufficiently smaller than that of the Sun; thus, their partial "eclipses" of the Sun are best considered transits (see transit of Deimos and Phobos from Mars). Transits of Mercury and Venus have been observed from Mars. A transit of Earth will be seen from Mars on November 10, 2084. On October 19, 2014, Comet Siding Spring passed extremely close to Mars, so close that the coma may have enveloped Mars. The mean apparent magnitude of Mars is +0.71 with a standard deviation of 1.05. Because the orbit of Mars is eccentric, the magnitude at opposition from the Sun can range from about −3.0 to −1.4. The minimum brightness is magnitude +1.86 when the planet is in conjunction with the Sun. At its brightest, Mars (along with Jupiter) are second only to Venus in luminosity. Mars usually appears distinctly yellow, orange, or red. NASA's Spirit rover has taken pictures of a greenish-brown, mud-colored landscape with blue-grey rocks and patches of light red sand. When farthest away from Earth, it is more than seven times farther away than when it is closest. When least favorably positioned, it can be lost in the Sun's glare for months at a time. At its most favorable times—at 15- or 17-year intervals, and always between late July and late September—a lot of surface detail can be seen with a telescope. Especially noticeable, even at low magnification, are the polar ice caps. As Mars approaches opposition, it begins a period of retrograde motion, which means it will appear to move backwards in a looping motion with respect to the background stars. The duration of this retrograde motion lasts for about 72 days, and Mars reaches its peak luminosity in the middle of this motion. The point at which Mars's geocentric longitude is 180° different from the Sun's is known as opposition, which is near the time of closest approach to Earth. The time of opposition can occur as much as 8.5 days away from the closest approach. The distance at close approach varies between about 54 and 103 million km (34 and 64 million mi) due to the planets' elliptical orbits, which causes comparable variation in angular size. The last Mars opposition occurred on July 27, 2018, at a distance of about 58 million km (36 million mi). The next Mars opposition occurs on October 13, 2020, at a distance of about 63 million km (39 million mi). The average time between the successive oppositions of Mars, its synodic period, is 780 days; but the number of days between the dates of successive oppositions can range from 764 to 812. As Mars approaches opposition it begins a period of retrograde motion, which makes it appear to move backwards in a looping motion relative to the background stars. The duration of this retrograde motion is about 72 days. Mars made its closest approach to Earth and maximum apparent brightness in nearly 60,000 years, 55,758,006 km (0.37271925 AU; 34,646,419 mi), magnitude −2.88, on August 27, 2003, at 9:51:13 UTC. This occurred when Mars was one day from opposition and about three days from its perihelion, making it particularly easy to see from Earth. The last time it came so close is estimated to have been on September 12, 57,617 BC, the next time being in 2287. This record approach was only slightly closer than other recent close approaches. For instance, the minimum distance on August 22, 1924, was 7010557775660904950♠0.37285 AU, and the minimum distance on August 24, 2208, will be 7010557685902182530♠0.37279 AU. The history of observations of Mars is marked by the oppositions of Mars, when the planet is closest to Earth and hence is most easily visible, which occur every couple of years. Even more notable are the perihelic oppositions of Mars, which occur every 15 or 17 years and are distinguished because Mars is close to perihelion, making it even closer to Earth. 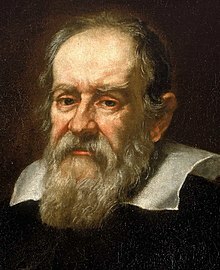 Galileo Galilei, first person to see Mars via telescope in 1610. The ancient Sumerians believed that Mars was Nergal, the god of war and plague. During Sumerian times, Nergal was a minor deity of little significance, but, during later times, his main cult center was the city of Nineveh. In Mesopotamian texts, Mars is referred to as the "star of judgement of the fate of the dead". 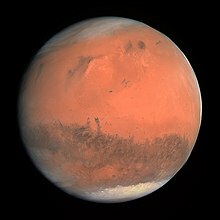 The existence of Mars as a wandering object in the night sky was recorded by the ancient Egyptian astronomers and, by 1534 BCE, they were familiar with the retrograde motion of the planet. By the period of the Neo-Babylonian Empire, the Babylonian astronomers were making regular records of the positions of the planets and systematic observations of their behavior. For Mars, they knew that the planet made 37 synodic periods, or 42 circuits of the zodiac, every 79 years. They invented arithmetic methods for making minor corrections to the predicted positions of the planets. In Ancient Greek, the planet was known as Πυρόεις. In the fourth century BCE, Aristotle noted that Mars disappeared behind the Moon during an occultation, indicating that the planet was farther away. Ptolemy, a Greek living in Alexandria, attempted to address the problem of the orbital motion of Mars. Ptolemy's model and his collective work on astronomy was presented in the multi-volume collection Almagest, which became the authoritative treatise on Western astronomy for the next fourteen centuries. Literature from ancient China confirms that Mars was known by Chinese astronomers by no later than the fourth century BCE. In the fifth century CE, the Indian astronomical text Surya Siddhanta estimated the diameter of Mars. In the East Asian cultures, Mars is traditionally referred to as the "fire star" (Chinese: 火星), based on the Five elements. During the seventeenth century, Tycho Brahe measured the diurnal parallax of Mars that Johannes Kepler used to make a preliminary calculation of the relative distance to the planet. When the telescope became available, the diurnal parallax of Mars was again measured in an effort to determine the Sun-Earth distance. This was first performed by Giovanni Domenico Cassini in 1672. The early parallax measurements were hampered by the quality of the instruments. The only occultation of Mars by Venus observed was that of October 13, 1590, seen by Michael Maestlin at Heidelberg. In 1610, Mars was viewed by Italian astronomer Galileo Galilei, who was first to see it via telescope. The first person to draw a map of Mars that displayed any terrain features was the Dutch astronomer Christiaan Huygens. By the 19th century, the resolution of telescopes reached a level sufficient for surface features to be identified. A perihelic opposition of Mars occurred on September 5, 1877. In that year, the Italian astronomer Giovanni Schiaparelli used a 22 cm (8.7 in) telescope in Milan to help produce the first detailed map of Mars. These maps notably contained features he called canali, which were later shown to be an optical illusion. These canali were supposedly long, straight lines on the surface of Mars, to which he gave names of famous rivers on Earth. His term, which means "channels" or "grooves", was popularly mistranslated in English as "canals". Influenced by the observations, the orientalist Percival Lowell founded an observatory which had 30 and 45 cm (12 and 18 in) telescopes. The observatory was used for the exploration of Mars during the last good opportunity in 1894 and the following less favorable oppositions. He published several books on Mars and life on the planet, which had a great influence on the public. The canali were independently found by other astronomers, like Henri Joseph Perrotin and Louis Thollon in Nice, using one of the largest telescopes of that time. The seasonal changes (consisting of the diminishing of the polar caps and the dark areas formed during Martian summer) in combination with the canals led to speculation about life on Mars, and it was a long-held belief that Mars contained vast seas and vegetation. The telescope never reached the resolution required to give proof to any speculations. As bigger telescopes were used, fewer long, straight canali were observed. During an observation in 1909 by Flammarion with an 84 cm (33 in) telescope, irregular patterns were observed, but no canali were seen. Even in the 1960s articles were published on Martian biology, putting aside explanations other than life for the seasonal changes on Mars. Detailed scenarios for the metabolism and chemical cycles for a functional ecosystem have been published. Once spacecraft visited the planet during NASA's Mariner missions in the 1960s and 70s, these concepts were radically broken. The results of the Viking life-detection experiments aided an intermission in which the hypothesis of a hostile, dead planet was generally accepted. Mariner 9 and Viking allowed better maps of Mars to be made using the data from these missions, and another major leap forward was the Mars Global Surveyor mission, launched in 1996 and operated until late 2006, that allowed complete, extremely detailed maps of the Martian topography, magnetic field and surface minerals to be obtained. These maps are available online; for example, at Google Mars. Mars Reconnaissance Orbiter and Mars Express continued exploring with new instruments, and supporting lander missions. NASA provides two online tools: Mars Trek, which provides visualizations of the planet using data from 50 years of exploration, and Experience Curiosity, which simulates traveling on Mars in 3-D with Curiosity. Mars is named after the Roman god of war. In different cultures, Mars represents masculinity and youth. Its symbol, a circle with an arrow pointing out to the upper right, is used as a symbol for the male gender. The many failures in Mars exploration probes resulted in a satirical counter-culture blaming the failures on an Earth-Mars "Bermuda Triangle", a "Mars Curse", or a "Great Galactic Ghoul" that feeds on Martian spacecraft. The fashionable idea that Mars was populated by intelligent Martians exploded in the late 19th century. Schiaparelli's "canali" observations combined with Percival Lowell's books on the subject put forward the standard notion of a planet that was a drying, cooling, dying world with ancient civilizations constructing irrigation works. It was some time afterward when the thought flashed upon my mind that the disturbances I had observed might be due to an intelligent control. Although I could not decipher their meaning, it was impossible for me to think of them as having been entirely accidental. The feeling is constantly growing on me that I had been the first to hear the greeting of one planet to another. Tesla's theories gained support from Lord Kelvin who, while visiting the United States in 1902, was reported to have said that he thought Tesla had picked up Martian signals being sent to the United States. Kelvin "emphatically" denied this report shortly before leaving: "What I really said was that the inhabitants of Mars, if there are any, were doubtless able to see New York, particularly the glare of the electricity." In a New York Times article in 1901, Edward Charles Pickering, director of the Harvard College Observatory, said that they had received a telegram from Lowell Observatory in Arizona that seemed to confirm that Mars was trying to communicate with Earth. Early in December 1900, we received from Lowell Observatory in Arizona a telegram that a shaft of light had been seen to project from Mars (the Lowell observatory makes a specialty of Mars) lasting seventy minutes. I wired these facts to Europe and sent out neostyle copies through this country. The observer there is a careful, reliable man and there is no reason to doubt that the light existed. It was given as from a well-known geographical point on Mars. That was all. Now the story has gone the world over. In Europe it is stated that I have been in communication with Mars, and all sorts of exaggerations have spring up. Whatever the light was, we have no means of knowing. Whether it had intelligence or not, no one can say. It is absolutely inexplicable. Pickering later proposed creating a set of mirrors in Texas, intended to signal Martians. Mars has become a kind of mythic arena onto which we have projected our Earthly hopes and fears. The depiction of Mars in fiction has been stimulated by its dramatic red color and by nineteenth century scientific speculations that its surface conditions might support not just life but intelligent life. 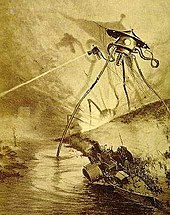 Thus originated a large number of science fiction scenarios, among which is H. G. Wells' The War of the Worlds, published in 1898, in which Martians seek to escape their dying planet by invading Earth. Influential works included Ray Bradbury's The Martian Chronicles, in which human explorers accidentally destroy a Martian civilization, Edgar Rice Burroughs' Barsoom series, C. S. Lewis' novel Out of the Silent Planet (1938), and a number of Robert A. Heinlein stories before the mid-sixties. Jonathan Swift made reference to the moons of Mars, about 150 years before their actual discovery by Asaph Hall, detailing reasonably accurate descriptions of their orbits, in the 19th chapter of his novel Gulliver's Travels. A comic figure of an intelligent Martian, Marvin the Martian, appeared in Haredevil Hare (1948) as a character in the Looney Tunes animated cartoons of Warner Brothers, and has continued as part of popular culture to the present. After the Mariner and Viking spacecraft had returned pictures of Mars as it really is, an apparently lifeless and canal-less world, these ideas about Mars had to be abandoned, and a vogue for accurate, realist depictions of human colonies on Mars developed, the best known of which may be Kim Stanley Robinson's Mars trilogy. Pseudo-scientific speculations about the Face on Mars and other enigmatic landmarks spotted by space probes have meant that ancient civilizations continue to be a popular theme in science fiction, especially in film. ^ This image was taken by the Rosetta spacecraft's Optical, Spectroscopic, and Infrared Remote Imaging System (OSIRIS), at a distance of ≈240,000 kilometres (150,000 mi) during its February 2007 encounter. The view is centered on the Aeolis quadrangle, with Gale crater, the landing site of the Curiosity rover, prominently visible just left of center. The darker, more heavily cratered terrain in the south, Terra Cimmeria, is composed of older terrain than the much smoother and brighter Elysium Planitia to the north. Geologically recent processes, such as the possible existence of a global ocean in Mars's past, could have helped lower-elevated areas, such as Elysium Planitia, retain a more youthful look. ^ a b c Seidelmann, P. Kenneth; Archinal, Brent A.; A'Hearn, Michael F.; et al. (2007). "Report of the IAU/IAG Working Group on cartographic coordinates and rotational elements: 2006". Celestial Mechanics and Dynamical Astronomy. 98 (3): 155–180. Bibcode:2007CeMDA..98..155S. doi:10.1007/s10569-007-9072-y. ^ Grego, Peter (June 6, 2012). Mars and How to Observe It. Springer Science+Business Media. ISBN 978-1-4614-2302-7 – via Google Books. ^ a b c Lodders, Katharina; Fegley, Bruce (1998). The Planetary Scientist's Companion. Oxford University Press. p. 190. ISBN 978-0-19-511694-6. ^ Konopliv, Alex S.; Asmar, Sami W.; Folkner, William M.; Karatekin, Özgür; Nunes, Daniel C.; et al. (January 2011). "Mars high resolution gravity fields from MRO, Mars seasonal gravity, and other dynamical parameters". Icarus. 211 (1): 401–428. Bibcode:2011Icar..211..401K. doi:10.1016/j.icarus.2010.10.004. ^ Hirt, C.; Claessens, S. J.; Kuhn, M.; Featherstone, W. E. (July 2012). "Kilometer-resolution gravity field of Mars: MGM2011". Planetary and Space Science. 67 (1): 147–154. Bibcode:2012P&SS...67..147H. doi:10.1016/j.pss.2012.02.006. hdl:20.500.11937/32270. ^ Folkner, W. M.; et al. (1997). "Interior Structure and Seasonal Mass Redistribution of Mars from Radio Tracking of Mars Pathfinder". Science. 278 (5344): 1749–1752. Bibcode:1997Sci...278.1749F. doi:10.1126/science.278.5344.1749. ISSN 0036-8075. ^ a b c d e f g h i Williams, David R. (September 1, 2004). "Mars Fact Sheet". National Space Science Data Center. NASA. Archived from the original on June 12, 2010. Retrieved June 24, 2006. ^ a b c d e Mallama, Anthony; Hilton, James L. (October 2018). "Computing apparent planetary magnitudes for The Astronomical Almanac". Astronomy and Computing. 25: 10–24. arXiv:1808.01973. Bibcode:2018A&C....25...10M. doi:10.1016/j.ascom.2018.08.002. ^ a b c "What is the typical temperature on Mars?". Astronomycafe.net. Retrieved August 14, 2012. ^ a b c "Mars Exploration Rover Mission: Spotlight". Marsrover.nasa.gov. June 12, 2007. Retrieved August 14, 2012. ^ a b Barlow, Nadine G. (2008). Mars: an introduction to its interior, surface and atmosphere. Cambridge planetary science. 8. Cambridge University Press. p. 21. ISBN 978-0-521-85226-5. ^ Zubrin, Robert; Wagner, Richard (1997). The Case for Mars: The Plan to Settle the Red Planet and Why We Must. New York: Touchstone. ISBN 978-0-684-83550-1. OCLC 489144963. ^ a b Rees, Martin J., ed. (October 2012). Universe: The Definitive Visual Guide. New York: Dorling Kindersley. pp. 160–161. ISBN 978-0-7566-9841-6. ^ "The Lure of Hematite". [email protected]. NASA. March 28, 2001. Archived from the original on January 14, 2010. Retrieved December 24, 2009. ^ a b c Yeager, Ashley (July 19, 2008). "Impact May Have Transformed Mars". ScienceNews.org. Retrieved August 12, 2008. ^ a b c Sample, Ian (June 26, 2008). "Cataclysmic impact created north-south divide on Mars". London: Science @ guardian.co.uk. Retrieved August 12, 2008. ^ Millis, John P. "Mars Moon Mystery". About.com. Space. ^ a b Adler, M.; Owen, W.; Riedel, J. (June 2012). Use of MRO Optical Navigation Camera to Prepare for Mars Sample Return (PDF). Concepts and Approaches for Mars Exploration. June 12–14, 2012. Houston, Texas. 4337. Bibcode:2012LPICo1679.4337A. ^ Jarell, Elizabeth M (February 26, 2015). "Using Curiosity to Search for Life". Mars Daily. Retrieved August 9, 2015. ^ "The Mars Exploration Rover Mission" (PDF). NASA. November 2013. p. 20. Archived from the original (PDF) on October 10, 2015. Retrieved August 9, 2015. ^ Wilks, Jeremy (May 21, 2015). "Mars mystery: ExoMars mission to finally resolve question of life on red planet". EuroNews. Retrieved August 9, 2015. ^ Howell, Elizabeth (January 5, 2015). "Life on Mars? NASA's next rover aims to find out". The Christian Science Monitor. Retrieved August 9, 2015. ^ a b "NASA – NASA Rover Finds Clues to Changes in Mars' Atmosphere". NASA. ^ a b c Kostama, V.-P.; Kreslavsky, M. A.; Head, J. W. (June 3, 2006). "Recent high-latitude icy mantle in the northern plains of Mars: Characteristics and ages of emplacement". Geophysical Research Letters. 33 (11): L11201. Bibcode:2006GeoRL..3311201K. CiteSeerX 10.1.1.553.1127. doi:10.1029/2006GL025946. Retrieved August 12, 2007. 'Martian high-latitude zones are covered with a smooth, layered ice-rich mantle'. ^ a b Byrne, Shane; Ingersoll, Andrew P. (2003). "A Sublimation Model for Martian South Polar Ice Features". Science. 299 (5609): 1051–1053. Bibcode:2003Sci...299.1051B. doi:10.1126/science.1080148. PMID 12586939. ^ a b "Mars' South Pole Ice Deep and Wide". NASA. March 15, 2007. Archived from the original on April 20, 2009. Retrieved March 16, 2007. ^ "Lake of frozen water the size of New Mexico found on Mars – NASA". The Register. November 22, 2016. Retrieved November 23, 2016. ^ "Mars Ice Deposit Holds as Much Water as Lake Superior". NASA. November 22, 2016. Retrieved November 23, 2016. ^ Staff (November 22, 2016). "Scalloped Terrain Led to Finding of Buried Ice on Mars". NASA. Retrieved November 23, 2016. ^ "Slide 2 Earth Telescope View of Mars". The Red Planet: A Survey of Mars. Lunar and Planetary Institute. ^ Peplow, Mark (May 6, 2004). "How Mars got its rust". Nature. Macmillan Publishers Ltd. Retrieved March 10, 2007. ^ Nimmo, Francis; Tanaka, Ken (2005). "Early Crustal Evolution of Mars". Annual Review of Earth and Planetary Sciences. 33 (1): 133–161. Bibcode:2005AREPS..33..133N. doi:10.1146/annurev.earth.33.092203.122637. ^ Rivoldini, A.; Van Hoolst, T.; Verhoeven, O.; Mocquet, A.; Dehant, V. (June 2011). "Geodesy constraints on the interior structure and composition of Mars". Icarus. 213 (2): 451–472. Bibcode:2011Icar..213..451R. doi:10.1016/j.icarus.2011.03.024. ^ a b Jacqué, Dave (September 26, 2003). "APS X-rays reveal secrets of Mars' core". Argonne National Laboratory. Archived from the original on February 21, 2009. Retrieved July 1, 2006. ^ McSween, Harry Y.; Taylor, G. Jeffrey; Wyatt, Michael B. (May 2009). "Elemental Composition of the Martian Crust". Science. 324 (5928): 736–739. Bibcode:2009Sci...324..736M. doi:10.1126/science.1165871. PMID 19423810. ^ Bandfield, Joshua L. (June 2002). "Global mineral distributions on Mars". Journal of Geophysical Research: Planets. 107 (E6): 9–1–9–20. Bibcode:2002JGRE..107.5042B. doi:10.1029/2001JE001510. ^ Christensen, Philip R.; et al. (June 27, 2003). "Morphology and Composition of the Surface of Mars: Mars Odyssey THEMIS Results" (PDF). Science. 300 (5628): 2056–2061. Bibcode:2003Sci...300.2056C. doi:10.1126/science.1080885. PMID 12791998. ^ Golombek, Matthew P. (June 27, 2003). "The Surface of Mars: Not Just Dust and Rocks". Science. 300 (5628): 2043–2044. doi:10.1126/science.1082927. PMID 12829771. ^ Tanaka, Kenneth L.; Skinner, James A. Jr.; Dohm, James M.; Irwin, Rossman P. III; Kolb, Eric J.; Fortezzo, Corey M.; Platz, Thomas; Michael, Gregory G.; Hare, Trent M. (July 14, 2014). "Geologic Map of Mars – 2014". USGS. Retrieved July 22, 2014. ^ Valentine, Theresa; Amde, Lishan (November 9, 2006). "Magnetic Fields and Mars". Mars Global Surveyor @ NASA. Retrieved July 17, 2009. ^ Neal-Jones, Nancy; O'Carroll, Cynthia. "New Map Provides More Evidence Mars Once Like Earth". NASA/Goddard Space Flight Center. Retrieved December 4, 2011. ^ Halliday, A. N.; Wänke, H.; Birck, J.-L.; Clayton, R. N. (2001). "The Accretion, Composition and Early Differentiation of Mars". Space Science Reviews. 96 (1/4): 197–230. Bibcode:2001SSRv...96..197H. doi:10.1023/A:1011997206080. ^ Zharkov, V. N. (1993). The role of Jupiter in the formation of planets. Washington DC American Geophysical Union Geophysical Monograph Series. Geophysical Monograph Series. 74. pp. 7–17. Bibcode:1993GMS....74....7Z. doi:10.1029/GM074p0007. ISBN 978-1-118-66669-2. ^ Lunine, Jonathan I.; Chambers, John; Morbidelli, Alessandro; Leshin, Laurie A. (2003). "The origin of water on Mars". Icarus. 165 (1): 1–8. Bibcode:2003Icar..165....1L. doi:10.1016/S0019-1035(03)00172-6. ^ "Giant Asteroid Flattened Half of Mars, Studies Suggest". Scientific American. Retrieved June 27, 2008. ^ Chang, Kenneth (June 26, 2008). "Huge Meteor Strike Explains Mars's Shape, Reports Say". The New York Times. Retrieved June 27, 2008. ^ "Mars: The Planet that Lost an Ocean's Worth of Water". Retrieved June 19, 2015. ^ Tanaka, K. L. (1986). "The Stratigraphy of Mars". Journal of Geophysical Research. 91 (B13): E139–E158. Bibcode:1986JGR....91..139T. doi:10.1029/JB091iB13p0E139. ^ Hartmann, William K.; Neukum, Gerhard (2001). "Cratering Chronology and the Evolution of Mars". Space Science Reviews. 96 (1/4): 165–194. Bibcode:2001SSRv...96..165H. doi:10.1023/A:1011945222010. ^ Mitchell, Karl L.; Wilson, Lionel (2003). "Mars: recent geological activity : Mars: a geologically active planet". Astronomy & Geophysics. 44 (4): 4.16–4.20. Bibcode:2003A&G....44d..16M. doi:10.1046/j.1468-4004.2003.44416.x. ^ "Mars avalanche caught on camera". Space.com. March 3, 2008. Retrieved August 16, 2018. ^ "Martian soil 'could support life'". BBC News. June 27, 2008. Retrieved August 7, 2008. ^ Chang, Alicia (August 5, 2008). "Scientists: Salt in Mars soil not bad for life". USA Today. Associated Press. Retrieved August 7, 2008. ^ "NASA Spacecraft Analyzing Martian Soil Data". JPL. Retrieved August 5, 2008. ^ Kounaves, S. P.; et al. (2010). "Wet Chemistry Experiments on the 2007 Phoenix Mars Scout Lander: Data Analysis and Results". J. Geophys. Res. 115 (E3): E00–E10. Bibcode:2009JGRE..114.0A19K. doi:10.1029/2008JE003084. ^ Kounaves, S. P.; et al. (2010). "Soluble Sulfate in the Martian Soil at the Phoenix Landing Site". Icarus. 37 (9): L09201. Bibcode:2010GeoRL..37.9201K. doi:10.1029/2010GL042613. ^ David, Leonard (June 13, 2013). "Toxic Mars: Astronauts Must Deal with Perchlorate on the Red Planet". Space.com. Retrieved November 26, 2018. ^ Sample, Ian (July 6, 2017). "Mars covered in toxic chemicals that can wipe out living organisms, tests reveal". The Guardian. Retrieved November 26, 2018. ^ "Dust Devil Etch-A-Sketch (ESP_013751_1115)". NASA/JPL/University of Arizona. July 2, 2009. Retrieved January 1, 2010. ^ Schorghofer, Norbert; Aharonson, Oded; Khatiwala, Samar (2002). "Slope streaks on Mars: Correlations with surface properties and the potential role of water". Geophysical Research Letters. 29 (23): 41–1. Bibcode:2002GeoRL..29.2126S. doi:10.1029/2002GL015889. ^ Gánti, Tibor; et al. (2003). "Dark Dune Spots: Possible Biomarkers on Mars?". Origins of Life and Evolution of the Biosphere. 33 (4): 515–557. Bibcode:2003OLEB...33..515G. doi:10.1023/A:1025705828948. 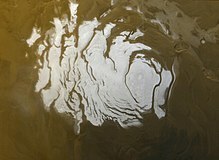 ^ a b "Water ice in crater at Martian north pole". ESA. July 28, 2005. Retrieved March 19, 2010. ^ Whitehouse, David (January 24, 2004). "Long history of water and Mars". BBC News. Retrieved March 20, 2010. ^ a b "Scientists Discover Concealed Glaciers on Mars at Mid-Latitudes". University of Texas at Austin. November 20, 2008. Archived from the original on July 25, 2011. Retrieved March 19, 2010. ^ a b "NASA Spacecraft Confirms Martian Water, Mission Extended". Science @ NASA. July 31, 2008. Retrieved August 1, 2008. ^ Kerr, Richard A. (March 4, 2005). "Ice or Lava Sea on Mars? A Transatlantic Debate Erupts". Science. 307 (5714): 1390–1391. doi:10.1126/science.307.5714.1390a. PMID 15746395. ^ Jaeger, W. L.; et al. (September 21, 2007). 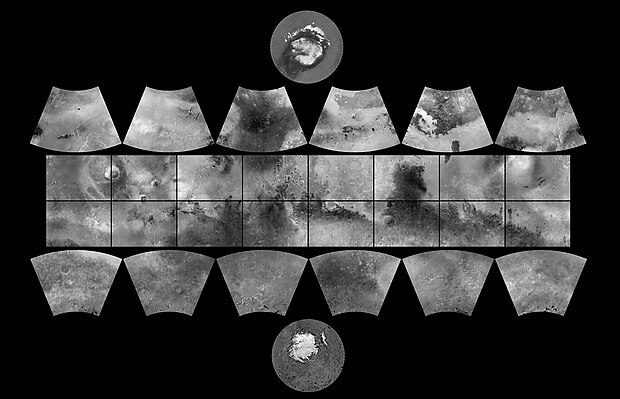 "Athabasca Valles, Mars: A Lava-Draped Channel System". Science. 317 (5845): 1709–1711. Bibcode:2007Sci...317.1709J. doi:10.1126/science.1143315. PMID 17885126. ^ Lucchitta, B. K.; Rosanova, C. E. (August 26, 2003). "Valles Marineris; The Grand Canyon of Mars". USGS. Archived from the original on June 11, 2011. Retrieved March 11, 2007. ^ Murray, John B.; et al. (March 17, 2005). "Evidence from the Mars Express High Resolution Stereo Camera for a frozen sea close to Mars' equator". Nature. 434 (703): 352–356. Bibcode:2005Natur.434..352M. doi:10.1038/nature03379. PMID 15772653. ^ Craddock, R.A.; Howard, A.D. (2002). "The case for rainfall on a warm, wet early Mars". Journal of Geophysical Research. 107 (E11): 21–1. Bibcode:2002JGRE..107.5111C. CiteSeerX 10.1.1.485.7566. doi:10.1029/2001JE001505. ^ Malin, Michael C.; Edgett, KS (June 30, 2000). "Evidence for Recent Groundwater Seepage and Surface Runoff on Mars". Science. 288 (5475): 2330–2335. Bibcode:2000Sci...288.2330M. doi:10.1126/science.288.5475.2330. PMID 10875910. ^ a b "NASA Images Suggest Water Still Flows in Brief Spurts on Mars". NASA. December 6, 2006. Retrieved December 6, 2006. ^ "Water flowed recently on Mars". BBC. December 6, 2006. Retrieved December 6, 2006. ^ "Water May Still Flow on Mars, NASA Photo Suggests". NASA. December 6, 2006. Retrieved April 30, 2006. ^ Lewis, K.W. ; Aharonson, O. (2006). "Stratigraphic analysis of the distributary fan in Eberswalde crater using stereo imagery". Journal of Geophysical Research. 111 (E06001): E06001. Bibcode:2006JGRE..111.6001L. doi:10.1029/2005JE002558. ^ Matsubara, Y.; Howard, A.D.; Drummond, S.A. (2011). "Hydrology of early Mars: Lake basins". Journal of Geophysical Research. 116 (E04001): E04001. Bibcode:2011JGRE..116.4001M. doi:10.1029/2010JE003739. ^ Steep Slopes on Mars Reveal Structure of Buried Ice. NASA Press Release. January 11, 2018. ^ "Mineral in Mars 'Berries' Adds to Water Story" (Press release). NASA. March 3, 2004. Archived from the original on November 9, 2007. Retrieved June 13, 2006. ^ "Mars Exploration Rover Mission: Science". NASA. July 12, 2007. Retrieved January 10, 2010. ^ "NASA – NASA Mars Rover Finds Mineral Vein Deposited by Water". NASA. December 7, 2011. Retrieved August 14, 2012. ^ "Rover Finds "Bulletproof" Evidence of Water on Early Mars". National Geographic. December 8, 2011. Retrieved August 14, 2012. ^ "Mars Has "Oceans" of Water Inside?". National Geographic. June 26, 2012. Retrieved August 14, 2012. ^ Staff (February 21, 2005). "Mars pictures reveal frozen sea". ESA. Retrieved March 19, 2010. ^ a b Webster, Guy; Brown, Dwayne (March 18, 2013). "Curiosity Mars Rover Sees Trend in Water Presence". NASA. Retrieved March 20, 2013. ^ Rincon, Paul (March 19, 2013). "Curiosity breaks rock to reveal dazzling white interior". BBC News. BBC. Retrieved March 19, 2013. ^ Staff (March 20, 2013). "Red planet coughs up a white rock, and scientists freak out". MSN. Archived from the original on March 23, 2013. Retrieved March 20, 2013. ^ "NASA News Conference: Evidence of Liquid Water on Today's Mars". NASA. September 28, 2015. Retrieved September 28, 2015. ^ "NASA Confirms Evidence That Liquid Water Flows on Today's Mars". NASA. 2015-09-28. Retrieved September 28, 2015. ^ Ojha, L.; Wilhelm, M. B.; Murchie, S. L.; McEwen, A. S.; Wray, J. J.; Hanley, J.; Massé, M.; Chojnacki, M. (2015). "Spectral evidence for hydrated salts in recurring slope lineae on Mars". Nature Geoscience. 8 (11): 829–832. Bibcode:2015NatGe...8..829O. doi:10.1038/ngeo2546. ^ McEwen, Alfred; Lujendra, Ojha; Dundas, Colin; Mattson, Sarah; Bryne, S; Wray, J; Cull, Selby; Murchie, Scott; Thomas, Nicholas; Gulick, Virginia (August 5, 2011). "Seasonal Flows on Warm Martian Slopes". Science. 333 (6043): 740–3. Bibcode:2011Sci...333..740M. doi:10.1126/science.1204816. PMID 21817049. Archived from the original on September 29, 2015. Retrieved September 28, 2015. ^ Drake, Nadia; 28, National Geographic PUBLISHED September (2015-09-28). "NASA Finds 'Definitive' Liquid Water on Mars". National Geographic News. Retrieved September 29, 2015. ^ Moskowitz, Clara. "Water Flows on Mars Today, NASA Announces". Retrieved September 29, 2015. ^ Anderson, Gina, ed. (September 28, 2015). "NASA Confirms Evidence That Liquid Water Flows on Today's Mars" (Press release). NASA. ^ Head, J.W. ; et al. (1999). "Possible Ancient Oceans on Mars: Evidence from Mars Orbiter Laser Altimeter Data". Science. 286 (5447): 2134–7. Bibcode:1999Sci...286.2134H. doi:10.1126/science.286.5447.2134. PMID 10591640. ^ Kaufman, Marc (March 5, 2015). "Mars Had an Ocean, Scientists Say, Pointing to New Data". The New York Times. Retrieved March 5, 2015. ^ a b "A winter wonderland in red and white – Korolev Crater on Mars". German Aerospace Center (DLR). Retrieved 20 December 2018. ^ "Mars Express beams back images of ice-filled Korolev crater". The Guardian. Retrieved December 21, 2018. ^ Mellon, J. T.; Feldman, W. C.; Prettyman, T. H. (2003). "The presence and stability of ground ice in the southern hemisphere of Mars". Icarus. 169 (2): 324–340. Bibcode:2004Icar..169..324M. doi:10.1016/j.icarus.2003.10.022. ^ "Mars Rovers Spot Water-Clue Mineral, Frost, Clouds". NASA. December 13, 2004. Retrieved March 17, 2006. ^ Malin, M.C. ; Caplinger, M.A. ; Davis, S.D. (2001). "Observational evidence for an active surface reservoir of solid carbon dioxide on Mars" (PDF). Science. 294 (5549): 2146–8. Bibcode:2001Sci...294.2146M. doi:10.1126/science.1066416. PMID 11768358. ^ "MIRA's Field Trips to the Stars Internet Education Program". Mira.or. Retrieved February 26, 2007. ^ Carr, Michael H. (2003). "Oceans on Mars: An assessment of the observational evidence and possible fate". Journal of Geophysical Research. 108 (5042): 24. Bibcode:2003JGRE..108.5042C. doi:10.1029/2002JE001963. ^ Phillips, Tony. "Mars is Melting, Science at NASA". Archived from the original on February 24, 2007. Retrieved February 26, 2007. ^ Plaut, J. J; et al. (2007). "Subsurface Radar Sounding of the South Polar Layered Deposits of Mars". Science. 316 (5821): 92–5. Bibcode:2007Sci...316...92P. doi:10.1126/science.1139672. PMID 17363628. ^ Smith, Isaac B.; Holt, J. W. (2010). "Onset and migration of spiral troughs on Mars revealed by orbital radar". Nature. 465 (4): 450–453. Bibcode:2010Natur.465..450S. doi:10.1038/nature09049. PMID 20505722. ^ "Mystery Spirals on Mars Finally Explained". Space.com. May 26, 2010. Retrieved May 26, 2010. ^ "NASA Findings Suggest Jets Bursting From Martian Ice Cap". Jet Propulsion Laboratory. NASA. August 16, 2006. Retrieved August 11, 2009. ^ Kieffer, H. H. (2000). "Mars Polar Science 2000" (PDF). Retrieved September 6, 2009. ^ Portyankina, G., ed. (2006). "Fourth Mars Polar Science Conference" (PDF). Retrieved August 11, 2009. ^ Kieffer, Hugh H.; Christensen, Philip R.; Titus, Timothy N. (May 30, 2006). "CO2 jets formed by sublimation beneath translucent slab ice in Mars' seasonal south polar ice cap". Nature. 442 (7104): 793–796. Bibcode:2006Natur.442..793K. doi:10.1038/nature04945. PMID 16915284. ^ Sheehan, William. "Areographers". The Planet Mars: A History of Observation and Discovery. Retrieved June 13, 2006. ^ Planetary Names: Categories for Naming Features on Planets and Satellites. Planetarynames.wr.usgs.gov. Retrieved December 1, 2011. ^ "Viking and the Resources of Mars" (PDF). Humans to Mars: Fifty Years of Mission Planning, 1950–2000. Retrieved March 10, 2007. ^ Frommert, H.; Kronberg, C. "Christiaan Huygens". SEDS/Lunar and Planetary Lab. Retrieved March 10, 2007. ^ Archinal, B. A.; Caplinger, M. (Fall 2002). "Mars, the Meridian, and Mert: The Quest for Martian Longitude". Abstract #P22D-06. 22: P22D–06. Bibcode:2002AGUFM.P22D..06A. ^ NASA (April 19, 2007). "Mars Global Surveyor: MOLA MEGDRs". geo.pds.nasa.gov. Archived from the original on November 13, 2011. Retrieved June 24, 2011. ^ Zeitler, W.; Ohlhof, T.; Ebner, H. (2000). "Recomputation of the global Mars control-point network" (PDF). Photogrammetric Engineering & Remote Sensing. 66 (2): 155–161. Archived from the original (PDF) on November 13, 2011. Retrieved December 26, 2009. ^ Lunine, Cynthia J. (1999). Earth: evolution of a habitable world. Cambridge University Press. p. 183. ISBN 978-0-521-64423-5. ^ a b Morton, Oliver (2002). Mapping Mars: Science, Imagination, and the Birth of a World. New York: Picador USA. p. 98. ISBN 0-312-24551-3. ^ "Online Atlas of Mars". Ralphaeschliman.com. Retrieved December 16, 2012. ^ "PIA03467: The MGS MOC Wide Angle Map of Mars". Photojournal. NASA / Jet Propulsion Laboratory. February 16, 2002. Retrieved December 16, 2012. ^ Webster, Guy; Brown, Dwayne (May 22, 2014). "NASA Mars Weathercam Helps Find Big New Crater". NASA. Retrieved May 22, 2014. ^ Wright, Shawn (April 4, 2003). "Infrared Analyses of Small Impact Craters on Earth and Mars". University of Pittsburgh. Archived from the original on June 12, 2007. Retrieved February 26, 2007. ^ "Mars Global Geography". Windows to the Universe. University Corporation for Atmospheric Research. April 27, 2001. Retrieved June 13, 2006. ^ Wetherill, G. W. (1999). "Problems Associated with Estimating the Relative Impact Rates on Mars and the Moon". Earth, Moon, and Planets. 9 (1–2): 227–231. Bibcode:1974Moon....9..227W. doi:10.1007/BF00565406. ^ Costard, Francois M. (1989). "The spatial distribution of volatiles in the Martian hydrolithosphere". Earth, Moon, and Planets. 45 (3): 265–290. Bibcode:1989EM&P...45..265C. doi:10.1007/BF00057747. ^ Chen, Junyong; et al. (2006). "Progress in technology for the 2005 height determination of Qomolangma Feng (Mt. Everest)". Science in China Series D: Earth Sciences. 49 (5): 531–538. doi:10.1007/s11430-006-0531-1. ^ Glenday, Craig (2009). Guinness World Records. Random House, Inc. p. 12. ISBN 978-0-553-59256-6. ^ Wolpert, Stuart (August 9, 2012). "UCLA scientist discovers plate tectonics on Mars". UCLA. Retrieved August 13, 2012. ^ Lin, An (June 4, 2012). "Structural analysis of the Valles Marineris fault zone: Possible evidence for large-scale strike-slip faulting on Mars". Lithosphere. 4 (4): 286–330. Bibcode:2012Lsphe...4..286Y. doi:10.1130/L192.1. Retrieved October 2, 2012. ^ Cushing, G. E.; Titus, T. N.; Wynne, J. J.; Christensen, P. R. (2007). "Themis Observes Possible Cave Skylights on Mars" (PDF). Lunar and Planetary Science XXXVIII. Retrieved August 2, 2007. ^ "NAU researchers find possible caves on Mars". Inside NAU. 4 (12). Northern Arizona University. March 28, 2007. Retrieved May 28, 2007. ^ "Researchers find possible caves on Mars". Paul Rincon of BBC News. March 17, 2007. Retrieved May 28, 2007. ^ a b Philips, Tony (2001). "The Solar Wind at Mars". [email protected] Archived from the original on October 10, 2006. Retrieved October 8, 2006. ^ "Multiple Asteroid Strikes May Have Killed Mars's Magnetic Field". Wired. January 20, 2011. ^ Lundin, R; et al. (2004). "Solar Wind-Induced Atmospheric Erosion at Mars: First Results from ASPERA-3 on Mars Express". Science. 305 (5692): 1933–1936. Bibcode:2004Sci...305.1933L. doi:10.1126/science.1101860. PMID 15448263. ^ Bolonkin, Alexander A. (2009). Artificial Environments on Mars. Berlin Heidelberg: Springer. pp. 599–625. ISBN 978-3-642-03629-3. ^ Atkinson, Nancy (July 17, 2007). "The Mars Landing Approach: Getting Large Payloads to the Surface of the Red Planet". Retrieved September 18, 2007. ^ Carr, Michael H. (2006). The surface of Mars. Cambridge planetary science series. 6. Cambridge University Press. p. 16. ISBN 978-0-521-87201-0. ^ Mahaffy, P. R.; Webster, C. R.; Atreya, S. K.; Franz, H.; Wong, M.; Conrad, P. G.; Harpold, D.; Jones, J. J.; Leshin, L. A.; Manning, H.; Owen, T.; Pepin, R. O.; Squyres, S.; Trainer, M.; Kemppinen, O.; Bridges, N.; Johnson, J. R.; Minitti, M.; Cremers, D.; Bell, J. F.; Edgar, L.; Farmer, J.; Godber, A.; Wadhwa, M.; Wellington, D.; McEwan, I.; Newman, C.; Richardson, M.; Charpentier, A.; et al. (July 19, 2013). "Abundance and Isotopic Composition of Gases in the Martian Atmosphere from the Curiosity Rover". Sciencemag.org. 341 (6143): 263–266. Bibcode:2013Sci...341..263M. doi:10.1126/science.1237966. PMID 23869014. Retrieved August 19, 2013. ^ Lemmon, M. T.; et al. (2004). "Atmospheric Imaging Results from Mars Rovers". Science. 306 (5702): 1753–1756. Bibcode:2004Sci...306.1753L. doi:10.1126/science.1104474. PMID 15576613. ^ Formisano, V.; Atreya, S.; Encrenaz, T.; Ignatiev, N.; Giuranna, M. (2004). "Detection of Methane in the Atmosphere of Mars". Science. 306 (5702): 1758–1761. Bibcode:2004Sci...306.1758F. doi:10.1126/science.1101732. PMID 15514118. ^ "Mars Express confirms methane in the Martian atmosphere". ESA. March 30, 2004. Retrieved March 17, 2006. ^ Sample, Ian (June 7, 2018). "Nasa Mars rover finds organic matter in ancient lake bed". The Guardian. Retrieved June 12, 2018. ^ a b c d Mumma, Michael J.; et al. (February 20, 2009). "Strong Release of Methane on Mars in Northern Summer 2003" (PDF). Science. 323 (5917): 1041–1045. Bibcode:2009Sci...323.1041M. doi:10.1126/science.1165243. PMID 19150811. ^ Hand, Eric (October 21, 2008). "Plumes of methane identified on Mars" (PDF). Nature News. Retrieved August 2, 2009. ^ Krasnopolsky, Vladimir A. (February 2005). "Some problems related to the origin of methane on Mars". Icarus. 180 (2): 359–367. Bibcode:2006Icar..180..359K. doi:10.1016/j.icarus.2005.10.015. ^ Franck, Lefèvre; Forget, François (August 6, 2009). "Observed variations of methane on Mars unexplained by known atmospheric chemistry and physics". Nature. 460 (7256): 720–723. Bibcode:2009Natur.460..720L. doi:10.1038/nature08228. PMID 19661912. ^ a b Oze, C.; Sharma, M. (2005). "Have olivine, will gas: Serpentinization and the abiogenic production of methane on Mars". Geophysical Research Letters. 32 (10): L10203. Bibcode:2005GeoRL..3210203O. doi:10.1029/2005GL022691. ^ Jones, Nancy; Steigerwald, Bill; Brown, Dwayne; Webster, Guy (October 14, 2014). "NASA Mission Provides Its First Look at Martian Upper Atmosphere". NASA. Retrieved October 15, 2014. ^ Tenenbaum, David (June 9, 2008). "Making Sense of Mars Methane". Astrobiology Magazine. Archived from the original on September 23, 2008. Retrieved October 8, 2008. ^ Steigerwald, Bill (January 15, 2009). "Martian Methane Reveals the Red Planet is not a Dead Planet". NASA/Goddard Space Flight Center. Archived from the original on January 17, 2009. Retrieved January 24, 2009. ^ "Mars Curiosity Rover News Telecon". November 2, 2012. ^ Kerr, Richard A. (November 2, 2012). "Curiosity Finds Methane on Mars, or Not". Science. Archived from the original on November 5, 2012. Retrieved November 3, 2012. ^ Wall, Mike (November 2, 2012). "Curiosity Rover Finds No Methane on Mars —Yet". Space.com. Retrieved November 3, 2012. ^ Chang, Kenneth (November 2, 2012). "Hope of Methane on Mars Fades". The New York Times. Retrieved November 3, 2012. ^ Webster, Christopher R.; Mahaffy, Paul R.; Atreya, Sushil K.; Flesch, Gregory J.; Farley, Kenneth A. (September 19, 2013). "Low Upper Limit to Methane Abundance on Mars". Science. 342 (6156): 355–357. Bibcode:2013Sci...342..355W. doi:10.1126/science.1242902. PMID 24051245. Retrieved September 19, 2013. ^ Cho, Adrian (September 19, 2013). "Mars Rover Finds No Evidence of Burps and Farts". Science. Archived from the original on September 20, 2013. Retrieved September 19, 2013. ^ Chang, Kenneth (September 19, 2013). "Mars Rover Comes Up Empty in Search for Methane". The New York Times. Retrieved September 19, 2013. ^ "Mars Orbiter Mission – Payloads". Indian Space Research Organisation (ISRO). ISRO. December 2014. Archived from the original on December 24, 2014. Retrieved December 23, 2014. ^ Amos, Jonathan (2019-04-10). "So where did the Mars methane go?". Retrieved 2019-04-11. ^ Webster, Guy; Neal-Jones, Nancy; Brown, Dwayne (December 16, 2014). "NASA Rover Finds Active and Ancient Organic Chemistry on Mars". NASA. Retrieved December 16, 2014. ^ Chang, Kenneth (December 16, 2014). "'A Great Moment': Rover Finds Clue That Mars May Harbor Life". The New York Times. Retrieved December 16, 2014. ^ a b Whitehouse, David (July 15, 2004). "Dr. David Whitehouse – Ammonia on Mars could mean life". BBC News. Retrieved August 14, 2012. ^ Webster, Guy; Neal-Jones, Nancy; Scott, Jim; Schmid, Deb; Cantillo, Laurie; Brown, Dwayne (September 29, 2017). "Large Solar Storm Sparks Global Aurora and Doubles Radiation Levels on the Martian Surface". NASA. ^ "Auroras on Mars – NASA Science". science.nasa.gov. Retrieved May 12, 2015. ^ Brown, Dwayne; Neal-Jones, Nancy; Steigerwald, Bill; Scott, Jim (March 18, 2015). "NASA Spacecraft Detects Aurora and Mysterious Dust Cloud around Mars". NASA. Release 15-045. Retrieved March 18, 2015. ^ Kluger, Jeffrey (September 1, 1992). "Mars, in Earth's Image". Discover Magazine. 13 (9): 70. Bibcode:1992Disc...13...70K. Retrieved November 3, 2009. ^ Goodman, Jason C (September 22, 1997). "The Past, Present, and Possible Future of Martian Climate". MIT. Archived from the original on November 10, 2010. Retrieved February 26, 2007. ^ Philips, Tony (July 16, 2001). "Planet Gobbling Dust Storms". Science @ NASA. Archived from the original on June 13, 2006. Retrieved June 7, 2006. ^ Wall, Mike (June 12, 2018). "NASA's Curiosity Rover Is Tracking a Huge Dust Storm on Mars (Photo)". Space.com. Retrieved June 13, 2018. ^ Badescu, Viorel (2009). Mars: Prospective Energy and Material Resources (illustrated ed.). Springer Science & Business Media. p. 600. ISBN 978-3-642-03629-3. ^ Vitagliano, Aldo (2003). "Mars' Orbital eccentricity over time". Solex. Universita' degli Studi di Napoli Federico II. Archived from the original on September 7, 2007. Retrieved July 20, 2007. ^ a b Meeus, Jean (March 2003). "When Was Mars Last This Close?". International Planetarium Society. Archived from the original on May 16, 2011. Retrieved January 18, 2008. ^ Baalke, Ron (August 22, 2003). "Mars Makes Closest Approach in Nearly 60,000 Years". meteorite-list. Retrieved January 18, 2008. ^ Nowack, Robert L. "Estimated Habitable Zone for the Solar System". Department of Earth and Atmospheric Sciences at Purdue University. Retrieved April 10, 2009. ^ Briggs, Helen (February 15, 2008). "Early Mars 'too salty' for life". BBC News. Retrieved February 16, 2008. ^ "PIA19673: Spectral Signals Indicating Impact Glass on Mars". NASA. June 8, 2015. Retrieved June 8, 2015. ^ Hannsson, Anders (1997). Mars and the Development of Life. Wiley. ISBN 978-0-471-96606-7. ^ "Press release: New Analysis of Viking Mission Results Indicates Presence of Life on Mars". Washington State University. January 5, 2006. ^ "Phoenix Returns Treasure Trove for Science". NASA/JPL. June 6, 2008. Retrieved June 27, 2008. ^ Bluck, John (July 5, 2005). "NASA Field-Tests the First System Designed to Drill for Subsurface Martian Life". NASA. Retrieved January 2, 2010. ^ Kounaves, S. P.; et al. (2014). "Evidence of martian perchlorate, chlorate, and nitrate in Mars meteorite EETA79001: implications for oxidants and organics". Icarus. 229: 206–213. Bibcode:2014Icar..229..206K. doi:10.1016/j.icarus.2013.11.012. ^ a b "Tiny Crystal Shapes Get Close Look From Mars Rover". NASA/JPL. February 8, 2018. ^ Kounaves, S. P.; et al. (2014). "Identification of the perchlorate parent salts at the Phoenix Mars landing site and implications". Icarus. 232: 226–231. Bibcode:2014Icar..232..226K. doi:10.1016/j.icarus.2014.01.016. ^ Golden, D. C.; et al. (2004). "Evidence for exclusively inorganic formation of magnetite in Martian meteorite ALH84001" (PDF). American Mineralogist. 89 (5–6): 681–695. Bibcode:2004AmMin..89..681G. doi:10.2138/am-2004-5-602. Archived from the original (PDF) on May 12, 2011. Retrieved December 25, 2010. ^ Krasnopolsky, Vladimir A.; Maillard, Jean-Pierre; Owen, Tobias C. (2004). 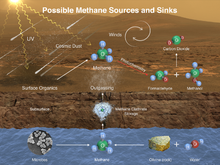 "Detection of methane in the Martian atmosphere: evidence for life?". Icarus. 172 (2): 537–547. Bibcode:2004Icar..172..537K. doi:10.1016/j.icarus.2004.07.004. ^ Peplow, Mark (February 25, 2005). "Formaldehyde claim inflames Martian debate". Nature. doi:10.1038/news050221-15. ^ Nickel, Mark (April 18, 2014). "Impact glass stores biodata for millions of years". Brown University. Retrieved June 9, 2015. ^ Schultz, P. H.; Harris, R. Scott; Clemett, S. J.; Thomas-Keprta, K. L.; Zárate, M. (June 2014). "Preserved flora and organics in impact melt breccias". Geology. 42 (6): 515–518. Bibcode:2014Geo....42..515S. doi:10.1130/G35343.1. hdl:2060/20140013110. ^ Brown, Dwayne; Webster, Guy; Stacey, Kevin (June 8, 2015). "NASA Spacecraft Detects Impact Glass on Surface of Mars" (Press release). NASA. Retrieved June 9, 2015. ^ Stacey, Kevin (June 8, 2015). "Martian glass: Window into possible past life?". Brown University. Retrieved June 9, 2015. ^ Temming, Maria (June 12, 2015). "Exotic Glass Could Help Unravel Mysteries of Mars". Scientific American. Retrieved June 15, 2015. ^ Smith, Deborah (May 10, 2017). "Press release: Oldest evidence of life on land found in 3.48 billion-year-old Australian rocks". University of New South Wales Sydney. ^ Djokic, Tara; Van Kranendonk, Martin J.; Campbell, Kathleen A.; Walter, Malcolm R.; Ward, Colin R. (May 9, 2017). "Earliest signs of life on land preserved in ca. 3.5 Ga hot spring deposits". Nature Communications. 8: 15263. Bibcode:2017NatCo...815263D. doi:10.1038/ncomms15263. PMC 5436104. PMID 28486437. ^ Brown, Dwayne; et al. (June 7, 2018). "NASA Finds Ancient Organic Material, Mysterious Methane on Mars". NASA. Retrieved June 12, 2018. ^ Wall, Mike (June 7, 2018). "Curiosity Rover Finds Ancient 'Building Blocks for Life' on Mars". Space.com. Retrieved June 7, 2018. ^ Chang, Kenneth (June 7, 2018). "Life on Mars? Rover's Latest Discovery Puts It 'On the Table'". The New York Times. Retrieved June 8, 2018. The identification of organic molecules in rocks on the red planet does not necessarily point to life there, past or present, but does indicate that some of the building blocks were present. ^ a b Orosei, R.; et al. (July 25, 2018). "Radar evidence of subglacial liquid water on Mars". Science. 361 (6401): 490–493. Bibcode:2018Sci...361..490O. doi:10.1126/science.aar7268. PMID 30045881. ^ Chang, Kenneth; Overbye, Dennis (July 25, 2018). "A Watery Lake Is Detected on Mars, Raising the Potential for Alien Life". The New York Times. Retrieved July 25, 2018. ^ Orosei, R.; et al. (July 25, 2018). "Supplementary Materials for: Radar evidence of subglacial liquid water on Mars". Science. 361 (6401): 490–493. Bibcode:2018Sci...361..490O. doi:10.1126/science.aar7268. PMID 30045881. ^ "Close Inspection for Phobos". ESA website. Retrieved June 13, 2006. ^ "Ares Attendants: Deimos & Phobos". Greek Mythology. Retrieved June 13, 2006. ^ Hunt, G. E.; Michael, W. H.; Pascu, D.; Veverka, J.; Wilkins, G. A.; Woolfson, M. (1978). "The Martian satellites—100 years on". Quarterly Journal of the Royal Astronomical Society. 19: 90–109. Bibcode:1978QJRAS..19...90H. ^ "Greek Names of the Planets". 2010-04-25. Archived from the original on May 9, 2010. Retrieved July 14, 2012. Aris is the Greek name of the planet Mars, the fourth planet from the sun, also known as the Red planet. Aris or Ares was the Greek god of War. See also the Greek article about the planet. ^ a b Arnett, Bill (November 20, 2004). "Phobos". nineplanets. Retrieved June 13, 2006. ^ Ellis, Scott. "Geological History: Moons of Mars". CalSpace. Archived from the original on May 17, 2007. Retrieved August 2, 2007. ^ Andert, T. P.; Rosenblatt, P.; Pätzold, M.; Häusler, B.; Dehant, V.; Tyler, G. L.; Marty, J. C. (May 7, 2010). "Precise mass determination and the nature of Phobos". Geophysical Research Letters. 37 (L09202): L09202. Bibcode:2010GeoRL..37.9202A. doi:10.1029/2009GL041829. ^ a b Giuranna, M.; Roush, T. L.; Duxbury, T.; Hogan, R. C.; Geminale, A.; Formisano, V. (2010). Compositional Interpretation of PFS/MEx and TES/MGS Thermal Infrared Spectra of Phobos (PDF). European Planetary Science Congress Abstracts, Vol. 5. Retrieved October 1, 2010. ^ "Mars Moon Phobos Likely Forged by Catastrophic Blast". Space.com. September 27, 2010. Retrieved October 1, 2010. ^ "Mars Science Laboratory – Homepage". NASA. Archived from the original on July 30, 2009. ^ "Chemistry and Cam (ChemCam)". NASA. ^ "Curiosity Mars rover takes historic drill sample". BBC News. BBC. February 10, 2013. Retrieved February 10, 2013. ^ Jha, Alok (September 26, 2013). "Nasa's Curiosity rover finds water in Martian soil". The Guardian. Retrieved November 6, 2013. ^ Webster, Guy; Cole, Steve; Stolte, Daniel (August 4, 2011). "NASA Spacecraft Data Suggest Water Flowing on Mars". NASA. Retrieved September 19, 2011. ^ "ISRO: Mars Orbiter Mission". isro.gov.in. Archived from the original on November 9, 2013. ^ Amos, Jonathan (March 14, 2016). "Mars TGO probe despatched on methane investigation". BBC News. Retrieved October 11, 2016. ^ Clery, Daniel (October 21, 2016). "Update: R.I.P. Schiaparelli: Crash site spotted for European Mars lander". Science. ^ Brown, Dwayne; Wendel, JoAnna; Agle, D. C. (November 26, 2018). "NASA InSight Lander Arrives on Martian Surface". Mars Exploration Program. NASA. Retrieved November 27, 2018. ^ Clark, Stephen (March 9, 2016). "InSight Mars lander escapes cancellation, aims for 2018 launch". Spaceflight Now. Retrieved March 9, 2016. ^ "Mars 2020 Mission Overview". NASA. Retrieved October 11, 2016. ^ "Second ExoMars mission moves to next launch opportunity in 2020" (Press release). European Space Agency. May 2, 2016. Retrieved May 2, 2016. ^ mars.nasa.gov. "Mars 2020 Rover". mars.nasa.gov. Retrieved 2019-03-23. ^ Schreck, Adam (May 6, 2015). "UAE to explore Mars' atmosphere with probe named 'Hope'". Excite News. Associated Press. Retrieved May 31, 2015. ^ Chang, Kenneth (September 27, 2016). "Elon Musk's Plan: Get Humans to Mars, and Beyond". The New York Times. Retrieved October 11, 2016. ^ Obama, Barack (October 11, 2016). "Barack Obama: America will take the giant leap to Mars". CNN. Retrieved October 11, 2016. ^ Victor, Daniel (October 11, 2016). "Obama Gives New Details About Sending People to Mars". The New York Times. Retrieved October 11, 2016. ^ Galeon, Dom; Creighton, Jolene (March 9, 2017). "US Government Issues NASA Demand, 'Get Humans to Mars By 2033'". Futurism. Retrieved February 16, 2018. ^ "Deimos". Planetary Societies's Explore the Cosmos. Archived from the original on June 5, 2011. Retrieved June 13, 2006. ^ Bertaux, Jean-Loup; et al. (2005). "Discovery of an aurora on Mars". Nature. 435 (7043): 790–4. Bibcode:2005Natur.435..790B. doi:10.1038/nature03603. PMID 15944698. ^ Bell, J. F., III; et al. (July 7, 2005). "Solar eclipses of Phobos and Deimos observed from the surface of Mars". Nature. 436 (7047): 55–57. Bibcode:2005Natur.436...55B. doi:10.1038/nature03437. PMID 16001060. ^ Staff (March 17, 2004). "Martian Moons Block Sun in Unique Eclipse Images From Another Planet". SpaceDaily. Retrieved February 13, 2010. ^ Meeus, J.; Goffin, E. (1983). "Transits of Earth as seen from Mars". Journal of the British Astronomical Association. 93 (3): 120–123. Bibcode:1983JBAA...93..120M. ^ Webster, Guy; Brown, Dwayne; Jones, Nancy; Steigerwald, Bill (October 19, 2014). "All Three NASA Mars Orbiters Healthy After Comet Flyby". NASA. Retrieved October 20, 2014. ^ "A Comet's Brush With Mars". The New York Times. Agence France-Presse. October 19, 2014. Retrieved October 20, 2014. ^ Denis, Michel (October 20, 2014). "Spacecraft in great shape – our mission continues". European Space Agency. Retrieved October 21, 2014. ^ Staff (October 21, 2014). "I'm safe and sound, tweets MOM after comet sighting". The Hindu. Retrieved October 21, 2014. ^ Moorhead, Althea; Wiegert, Paul A.; Cooke, William J. (December 1, 2013). "The meteoroid fluence at Mars due to comet C/2013 A1 (Siding Spring)". Icarus. 231: 13–21. Bibcode:2014Icar..231...13M. doi:10.1016/j.icarus.2013.11.028. Retrieved December 7, 2013. ^ Grossman, Lisa (December 6, 2013). "Fiercest meteor shower on record to hit Mars via comet". New Scientist. Retrieved December 7, 2013. ^ St. Fleur, Nicholas (January 9, 2017). "Looking at Your Home Planet from Mars". The New York Times. Retrieved January 9, 2017. ^ Mallama, A. (2011). "Planetary magnitudes". Sky and Telescope. 121 (1): 51–56. ^ Lloyd, John; John Mitchinson (2006). The QI Book of General Ignorance. Britain: Faber and Faber Limited. pp. 102, 299. ISBN 978-0-571-24139-2. ^ Peck, Akkana. "Mars Observing FAQ". Shallow Sky. Retrieved June 15, 2006. ^ Zeilik, Michael (2002). Astronomy: the Evolving Universe (9th ed.). Cambridge University Press. p. 14. ISBN 978-0-521-80090-7. ^ "Close Encounter: Mars at Opposition". NASA. November 3, 2005. Retrieved March 19, 2010. ^ "Mars Close Up". The New York Times. August 1, 2018. Retrieved August 1, 2018. ^ a b Sheehan, William (February 2, 1997). "Appendix 1: Oppositions of Mars, 1901–2035". The Planet Mars: A History of Observation and Discovery. University of Arizona Press. Archived from the original on June 25, 2010. Retrieved January 30, 2010. ^ Rao, Joe (August 22, 2003). "NightSky Friday—Mars and Earth: The Top 10 Close Passes Since 3000 B.C." Space.com. Archived from the original on May 20, 2009. Retrieved June 13, 2006. ^ a b Peters, W. T. (1984). "The Appearance of Venus and Mars in 1610". Journal for the History of Astronomy. 15 (3): 211–214. Bibcode:1984JHA....15..211P. doi:10.1177/002182868401500306. ^ a b c Rabkin, Eric S. (2005). Mars: A Tour of the Human Imagination. Westport, Connecticut: Praeger. pp. 9–11. ISBN 978-0-275-98719-0. ^ Thompson, Henry O. (1970). Mekal: The God of Beth-Shan. Leiden, Germany: E. J. Brill. p. 125. ^ Novakovic, B. (2008). "Senenmut: An Ancient Egyptian Astronomer". Publications of the Astronomical Observatory of Belgrade. 85: 19–23. arXiv:0801.1331. Bibcode:2008POBeo..85...19N. ^ North, John David (2008). Cosmos: an illustrated history of astronomy and cosmology. University of Chicago Press. pp. 48–52. ISBN 978-0-226-59441-5. ^ Swerdlow, Noel M. (1998). "Periodicity and Variability of Synodic Phenomenon". The Babylonian theory of the planets. Princeton University Press. pp. 34–72. ISBN 978-0-691-01196-7. ^ Cicero, Marcus Tullius (1896). De Natura Deorum [On the Nature of the Gods]. Translated by Francis Brooks. London: Methuen. ^ Poor, Charles Lane (1908). The solar system: a study of recent observations. Science series. 17. G. P. Putnam's sons. p. 193. ^ Needham, Joseph; Ronan, Colin A. (1985). The Shorter Science and Civilisation in China: An Abridgement of Joseph Needham's Original Text. The shorter science and civilisation in China. 2 (3rd ed.). Cambridge University Press. p. 187. ISBN 978-0-521-31536-4. ^ Thompson, Richard (1997). "Planetary Diameters in the Surya-Siddhanta" (PDF). Journal of Scientific Exploration. 11 (2): 193–200 [193–6]. Archived from the original (PDF) on January 7, 2010. Retrieved March 13, 2010. ^ de Groot, Jan Jakob Maria (1912). "Fung Shui". Religion in China – Universism: A Key to the Study of Taoism and Confucianism. American Lectures on the History of Religions, volume 10. G. P. Putnam's Sons. p. 300. OCLC 491180. ^ Hulbert, Homer Bezaleel (1909) . The Passing of Korea. Doubleday, Page & Company. p. 426. OCLC 26986808. ^ Hirshfeld, Alan (2001). Parallax: the race to measure the cosmos. Macmillan. pp. 60–61. ISBN 978-0-7167-3711-7. ^ Breyer, Stephen (1979). "Mutual Occultation of Planets". Sky and Telescope. 57 (3): 220. Bibcode:1979S&T....57..220A. ^ Sheehan, William (1996). "2: Pioneers". The Planet Mars: A History of Observation and Discovery. uapress.arizona.edu. Tucson: University of Arizona. Retrieved January 16, 2010. ^ Snyder, Dave (May 2001). "An Observational History of Mars". Retrieved February 26, 2007. ^ a b Sagan, Carl (1980). Cosmos. New York City: Random House. p. 107. ISBN 978-0-394-50294-6. ^ Basalla, George (2006). "Percival Lowell: Champion of Canals". Civilized Life in the Universe: Scientists on Intelligent Extraterrestrials. Oxford University Press US. pp. 67–88. ISBN 978-0-19-517181-5. ^ Dunlap, David W. (October 1, 2015). "Life on Mars? You Read It Here First". The New York Times. Retrieved October 1, 2015. ^ Maria, K.; Lane, D. (2005). "Geographers of Mars". Isis. 96 (4): 477–506. doi:10.1086/498590. PMID 16536152. ^ Perrotin, M. (1886). "Observations des canaux de Mars". Bulletin Astronomique, Serie I (in French). 3: 324–329. Bibcode:1886BuAsI...3..324P. ^ Zahnle, K. (2001). "Decline and fall of the Martian empire". Nature. 412 (6843): 209–213. doi:10.1038/35084148. PMID 11449281. ^ Salisbury, F. B. (1962). "Martian Biology". Science. 136 (3510): 17–26. Bibcode:1962Sci...136...17S. doi:10.1126/science.136.3510.17. JSTOR 1708777. PMID 17779780. ^ Ward, Peter Douglas; Brownlee, Donald (2000). Rare earth: why complex life is uncommon in the universe. Copernicus Series (2nd ed.). Springer. p. 253. ISBN 978-0-387-95289-5. ^ Bond, Peter (2007). Distant worlds: milestones in planetary exploration. Copernicus Series. Springer. p. 119. ISBN 978-0-387-40212-3. ^ "New Online Tools Bring NASA's Journey to Mars to a New Generation". 2015-08-05. Retrieved August 5, 2015. ^ Dinerman, Taylor (September 27, 2004). "Is the Great Galactic Ghoul losing his appetite?". The space review. Retrieved March 27, 2007. ^ "Percivel Lowell's Canals". Archived from the original on February 19, 2007. Retrieved March 1, 2007. ^ Fergus, Charles (2004). "Mars Fever". Research/Penn State. 24 (2). Archived from the original on August 31, 2003. Retrieved August 2, 2007. ^ Tesla, Nikola (February 9, 1901). "Talking with the Planets". Collier's. Vol. 26 no. 19. pp. 4–5. ^ Cheney, Margaret (1981). Tesla: Man Out of Time. Englewood Cliffs, New Jersey: Prentice-Hall. p. 162. ISBN 978-0-13-906859-1. OCLC 7672251. ^ "Departure of Lord Kelvin". The New York Times. May 11, 1902. p. 29. ^ a b Pickering, Edward Charles (January 16, 1901). "The Light Flash From Mars" (PDF). The New York Times. Archived from the original (PDF) on June 5, 2007. Retrieved May 20, 2007. ^ Fradin, Dennis Brindell (1999). Is There Life on Mars?. McElderry Books. p. 62. ISBN 978-0-689-82048-9. ^ Lightman, Bernard V. (1997). Victorian Science in Context. University of Chicago Press. pp. 268–273. ISBN 978-0-226-48111-1. ^ Schwartz, Sanford (2009). C. S. Lewis on the Final Frontier: Science and the Supernatural in the Space Trilogy. Oxford University Press US. pp. 19–20. ISBN 978-0-19-537472-8. ^ Buker, Derek M. (2002). The science fiction and fantasy readers' advisory: the librarian's guide to cyborgs, aliens, and sorcerers. ALA readers' advisory series. ALA Editions. p. 26. ISBN 978-0-8389-0831-0. ^ Darling, David. "Swift, Jonathan and the moons of Mars". Retrieved March 1, 2007. ^ Rabkin, Eric S. (2005). Mars: a tour of the human imagination. Greenwood Publishing Group. pp. 141–142. ISBN 978-0-275-98719-0. ^ Miles, Kathy; Peters II, Charles F. "Unmasking the Face". StarrySkies.com. Archived from the original on September 26, 2007. Retrieved March 1, 2007. Look up Mars in Wiktionary, the free dictionary.